Notes from instructions by Phil Greenwood. In the 1930's Vickers designed and produced a series of weapon carriers, these included the MMG Carrier, Scout Carrier, Bren Carrier and Cavalry Carrier. These had two compartments, one at the front with driver and gunner, and a second small compartment for a third crewman at one side of the engine. In 1939 it was decided to build only one vehicle, the Universal Carrier, which could be adapted to different roles as required. 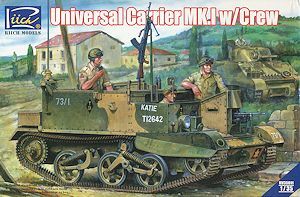 The Universal Carrier Mk.l appeared in 1940, it differed from earlier Carriers by having three compartments, the front was unchanged, but now two compartments were provided, one each side of the engine. These had raised rectangular sides which increased load capacity. It could carry up to 6 men and had more space for weapons or cargo. The basic Universal Carrier was often called "Bren Carrier" as it was armed with a .303 Bren light machine gun. Other variants included MMG (Vickers .303 MG) Artillery Tractor (6 Pounder A/T gun), Wireless (No9 or No19 radio set), Observation Post (OP), Wasp Flamethrower and Slave (extra batteries and starting equipment). They were used by almost all branches of the British and Commonwealth armies, with 113,000 being produced. Powered by a Ford V-8 85 bhp engine, the Universal Carrier had a speed of over 50 km/h and a range of 200 km. 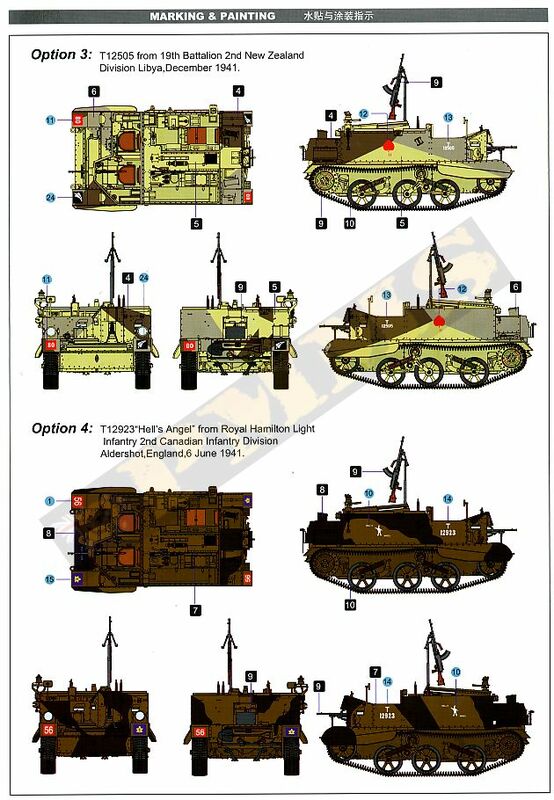 Armour was from 7-10mm and the combat weight was 4 tonnes. 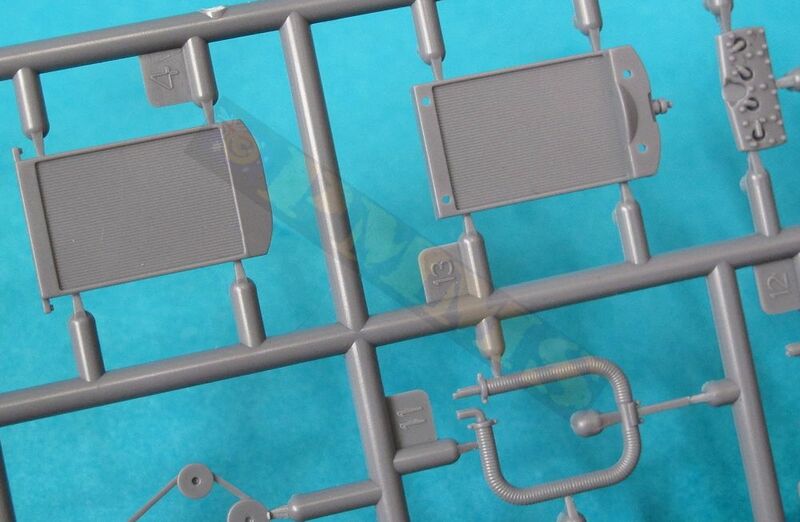 This is probably one of the most wanted kits among Allied models if recent years and is to my knowledge the first plastic kit of the Universal Carrier Mk.I to be produced, for those not familiar with the aging Tamiya kit this is a later Universal Carrier Mk.II and fairly overweight one at that needing to go on a diet, but that’s another story. 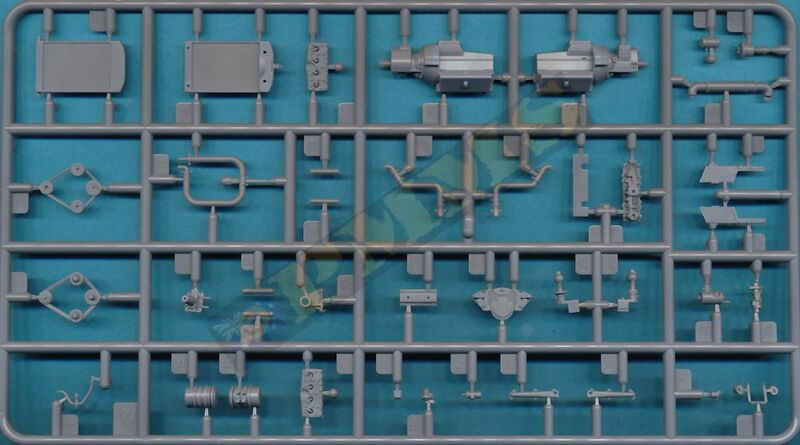 This new kit from Riich Models represents the initial Universal Carrier Mk.I which saw service throughout WWII on most fronts from Africa to Italy and NW Europe after D-Day, it was also used by nearly all Commonwealth forces and allies such as Polish units. The kit is extensively detailed with full engine and crew compartments and offers a few options; these include a choice of British or Canadian pattern head lights, alternate fender layout with either the small front fender guards or just with the full length bolt strip along the outer fenders as well as alternate storage arrangements. 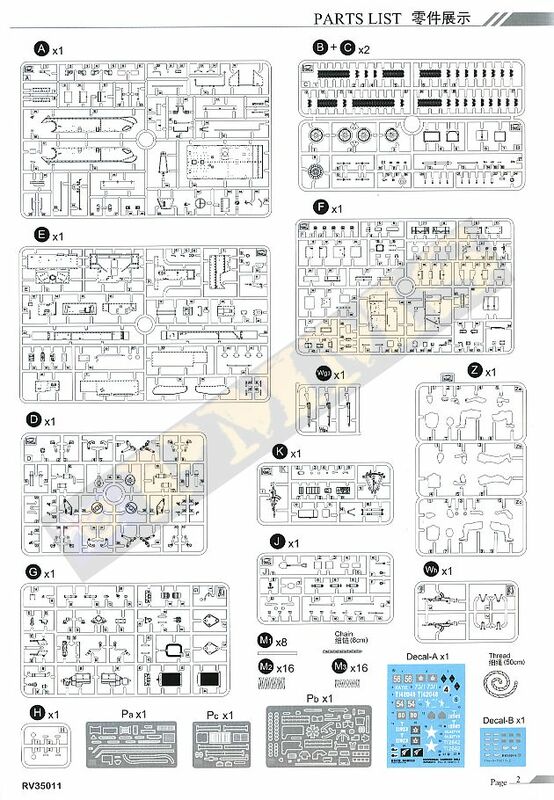 It should be said that this kit is not for inexperienced modellers as there are a few quite complicated assembly sequences with numerous small plastic and etched parts and yes it will take a bit of work but the fit of the parts is just superb meaning you don’t have to worry about filler or trimming to get things to fit which is good given the amount of detail included in the kit. 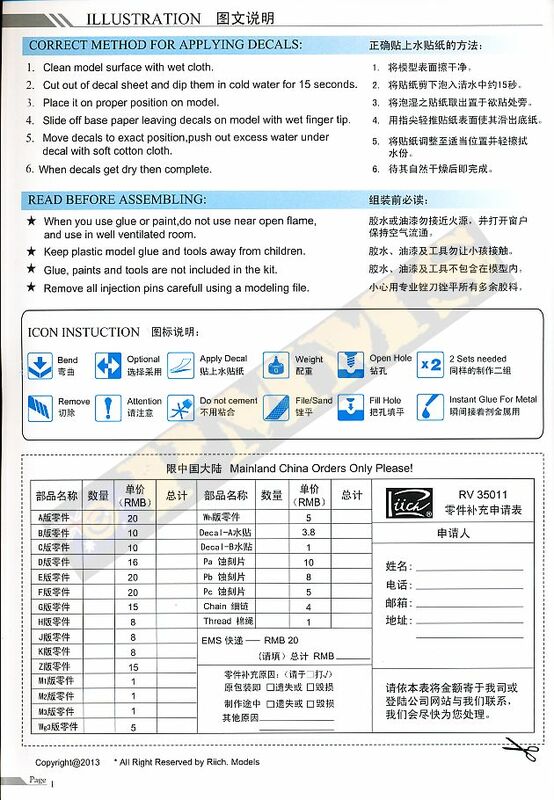 The main issue isn’t with the kit itself but the instructions which are not that logical in the assembly steps and will cause some problems if followed to the letter. 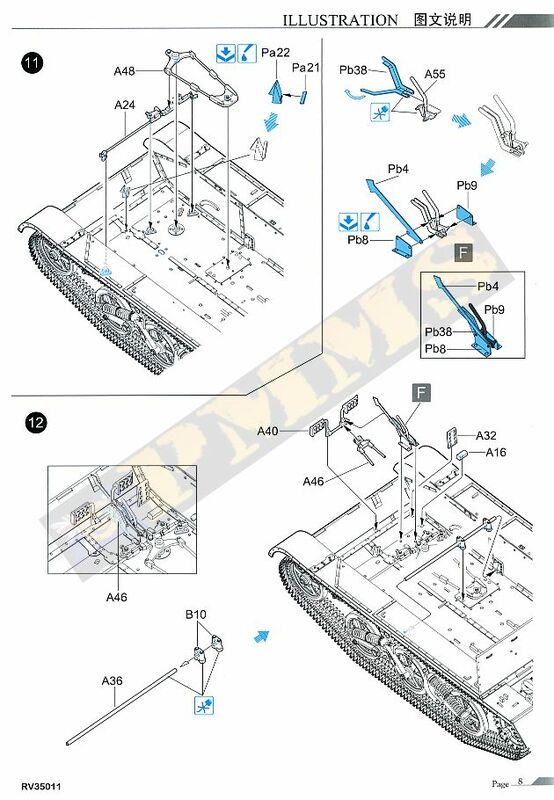 A few examples is the error with the axle/differential assembly outlined below as well as instances like the engine compartment with the initial assembly is in step 16/17 while additional smaller details not being added till later after the compartment has been fitted inside the hull but it is far easier to attach the numerous small parts with the compartment separate from the hull. 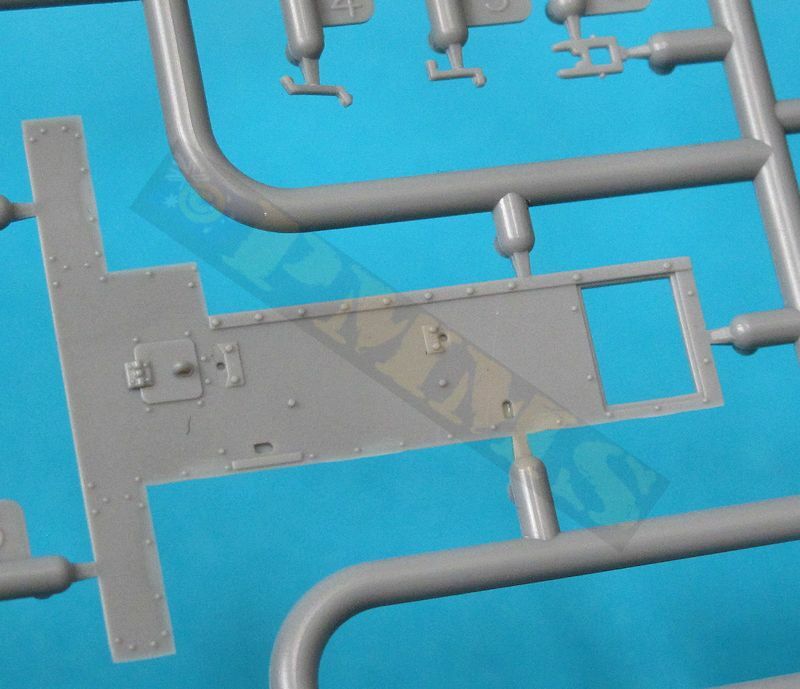 The same applies to the assembly of the front hull plate, this is assembled in step 30 with additional details such as the instrument panel added after the plate is attached to the hull and again is a lot easier to assemble all these parts before fitting the plate to the hull. 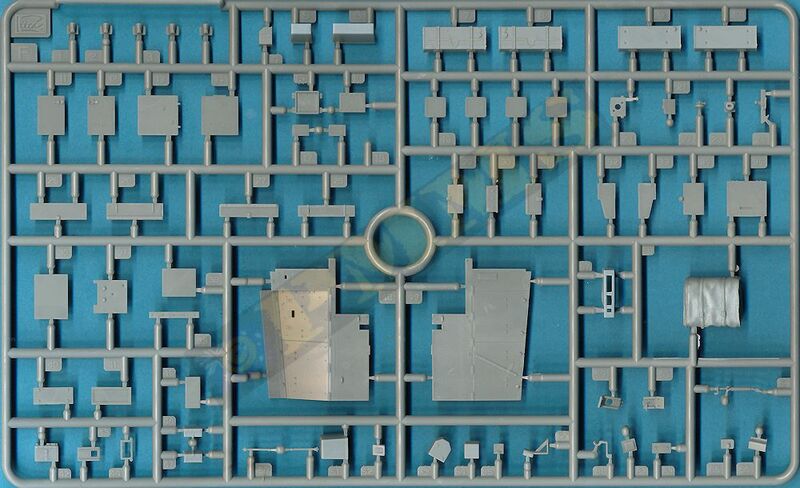 It is advisable to look ahead in the instructions to see what is coming as there are other instances where fitting parts before or differently from what is shown makes life easier on what is a quite intricate build so let’s have a closer look. 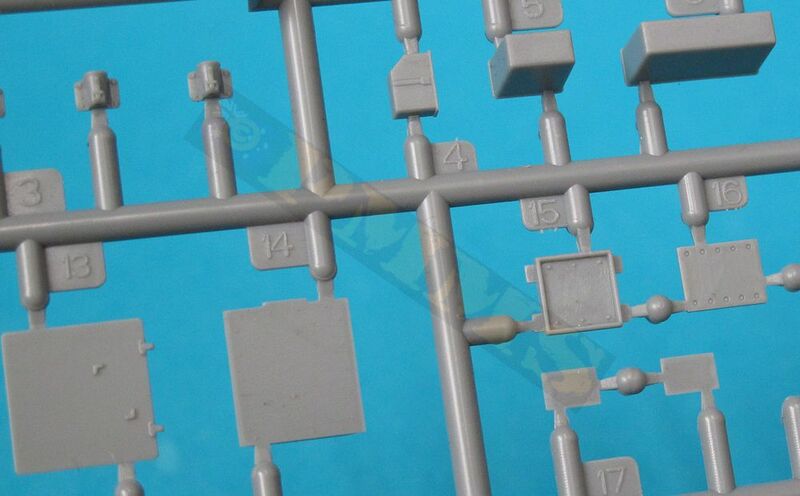 The standard of plastic moulding is very good with no warped parts, very little if any flash and minimal pin marks with just the usual mould lines and sprue attachment points to contend with. All the hull panels are separate parts, not a conventional hull tub with detail on both sides of the panels with a mix of raised and recessed detail and are moulded commendably thin for a nice scale appearance. The flush screws on the glacis are particularly well done although there are some very shallow pin marks on the insides of some panels most if not all are hidden by other parts during assembly so you don’t need to worry filling these, most notably those on the floor which are all covered by other detail so you don’t need to worry about these. 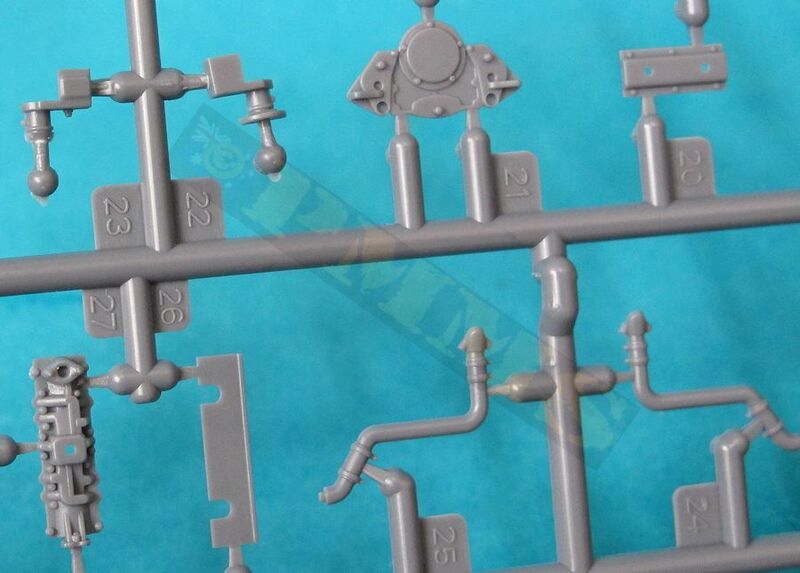 Dimension wise, I don’t have any 1:35 plans for the kit but the overall size of the assembled kit matches the stated dimensions of the real thing perfectly in width, length and height give or take a fraction in the measurement conversions. A notable feature of the hull panels and the storage boxes is all the joins are bevelled with just small locating notches not conventional pins and this makes for a very good flush fit of the corners and joins that is so good there was no need for any trimming or filler on any of the hull or box joins making for a very clean finish. The Ford V8 85HP No.3 Petrol Engine used in the UC Mk.I is highly detailed multi-part assembly with all the main features of the engine captured very well, the details on the parts is exceptionally well done with the Cylinder Head and rear Transmission being good examples of this. There are also etched parts for added detail such as the fan; this actually needs the edges of the blades bent at an angle to represent the actual fan. At the front is the large radiator with the two large top hoses and two small bottom hoses connecting the radiator to the engine assembly to form the one unit. All that is needed to finish of a superb rendition of the V8 engine is the addition of the extensive wiring and cabling but unfortunately none of the engine apart from the radiator face can be seen after assembly and so you can save a lot of assembly time by not including the engine and just fitting the radiator into the compartment. The engine can be used in a workshop diorama or similar if you wish but can of course be fitted for a case of “I know it’s in there”. 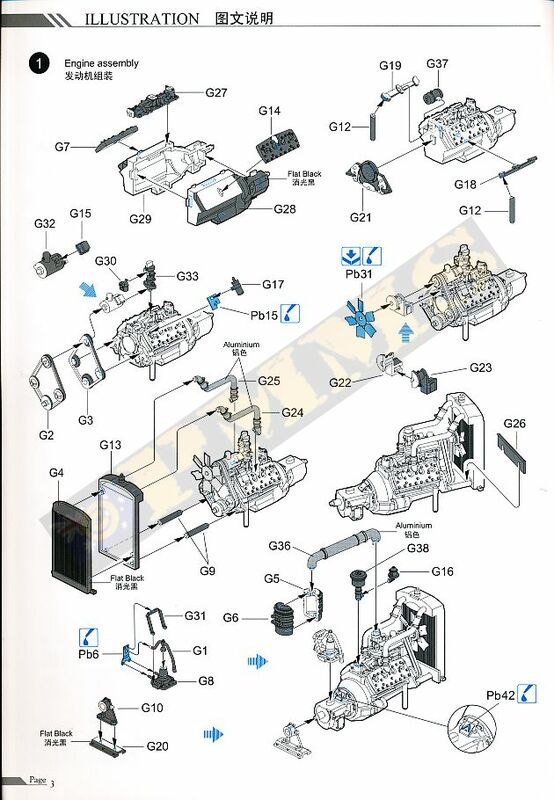 If fitting the engine there are a few modifications that will help in fitting the engine into the engine bay as it is a very snug fit, see page 3 of the assembly images below for details on this. 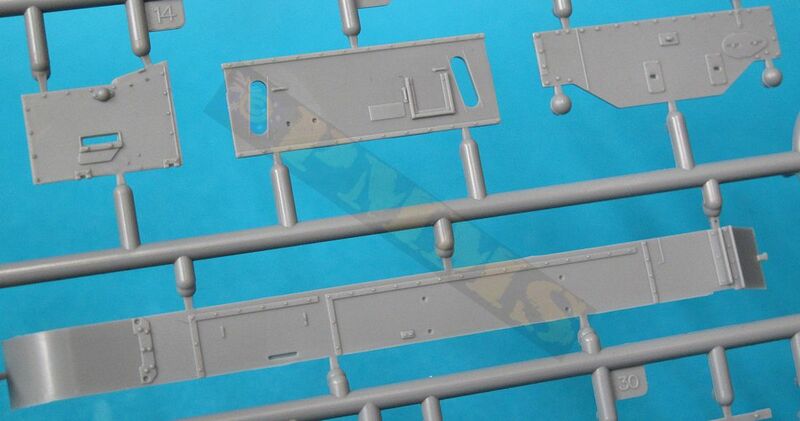 The lower hull has the floor and lower front plate as one with the side panels separate and they are moulded quite thin yet without any warping; the panels have details on both sides for good detail. 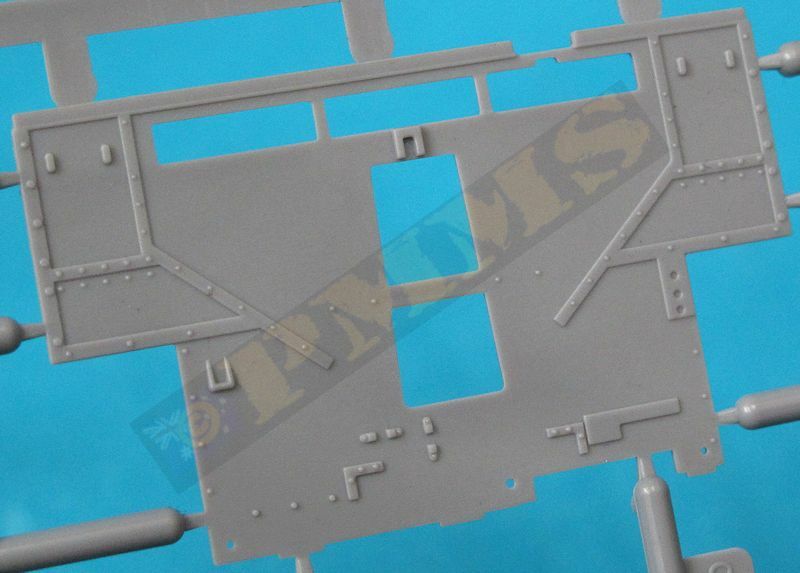 The inside floor has panels lines and some raised detail and locating holes for other parts included as well as some visible pin marks but as mentioned these are all hidden after assembly so don’t spend time filling these as it’s not necessary. Added to the floor are the two rear mounted fuel tanks made up of four parts each, these have fine joins along the sides but again these are hidden after assembly so there’s no need to spend time eliminating the seams. 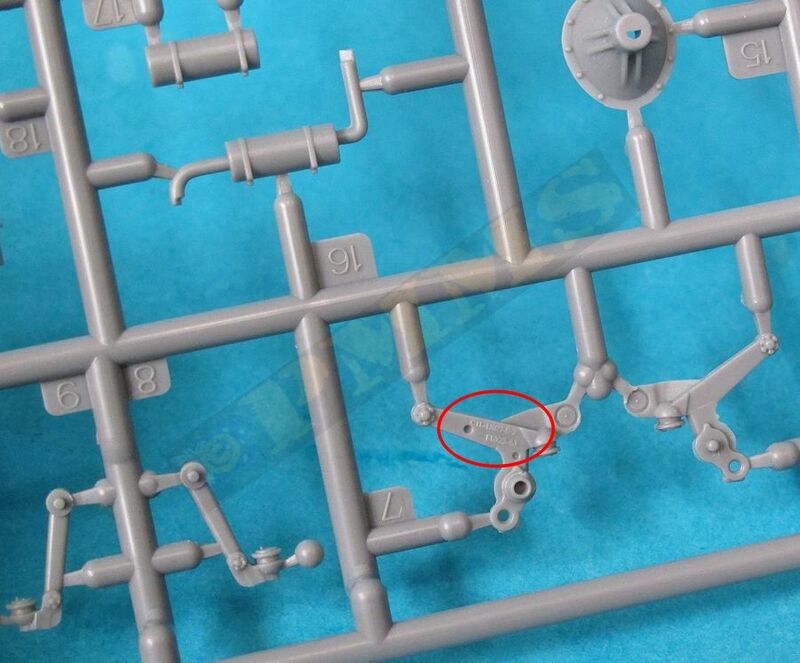 The real fuel tanks have wiring on the tank tops and the fuel lines leading into the engine bay if you have the references for adding these for additional detail. On the underside is the rear exhaust pipes and mounting brackets provided in etched brass, these need to be bent at right angles and a good etched bending tool will be needed, I have used the new Master Tools PE bending tool from the Trumpeter group for all the etched bending on this kit and this will form a separate review in due course, but back to this kit. There are very small locating pins on the underside of the floor that fit into the holes in the etched brackets and the fit was perfect, just note when fitting the brackets that the rear extends out past the floor at this stage with the plastic exhaust pipes fitting snugly between the brackets. Note the pipes sit on the brackets away from the floor so don’t try and sit the pipes flush with the floor. 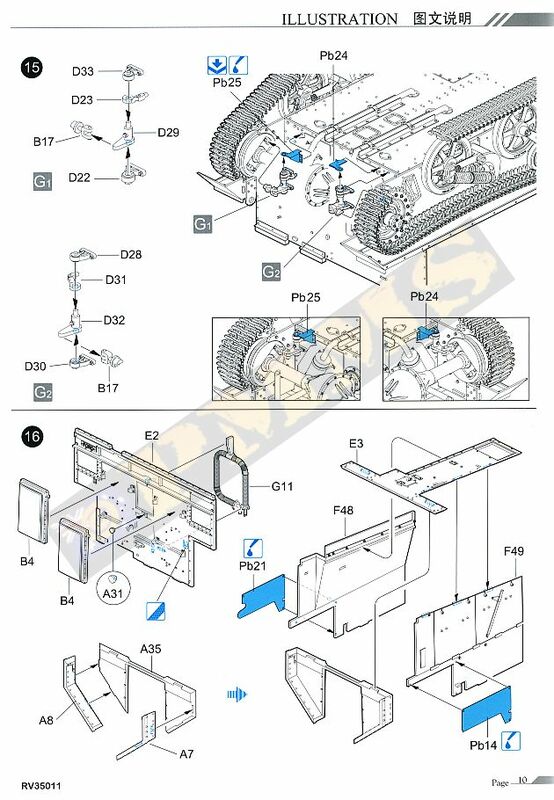 The instructions indicate to fit the side panels to the floor and the rear axle/differential next (Step 6) but I would suggest altering the assembly here and fit the inside steering linkages and the driver’s controls as well as the crew seats before fitting the side panels to give more working room as there isn’t a lot of room when the sides are fitted especially with fitting the seats. 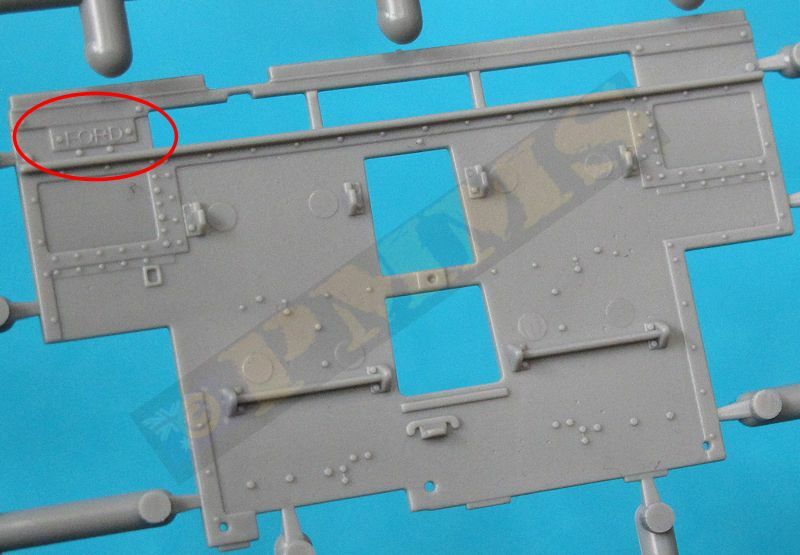 Also you need to fit the rear hull plate BEFORE the axle/differential as it’s a nightmare to fit the rear hull plate after the axle/differential is attached, but more on this soon. 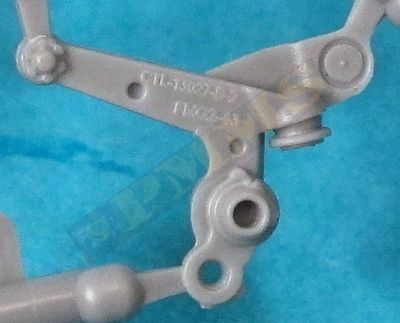 The steering linkages (steps 11, 12) are easily attached to the floor but the hand brake assemble with four etched parts is a little tricky, you need to glue the longer bracket (part Pb4) at the correct angle to mate with the front hull but there is no real indication as to the correct angle, this partly due to one of the small pins on the plastic part not formed properly so couldn’t act as a guide when fitting the etched part. 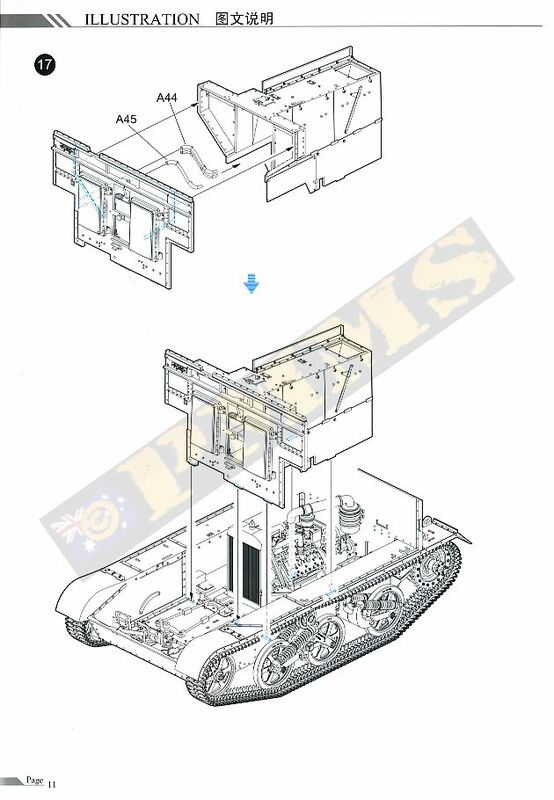 The central rod (part A36) is meant to fit into holes in the sidewalls but trimming the ends of this rod is okay to fit to the floor only as it’s hidden by the raised guards (E18, A53) fitted later in any case. 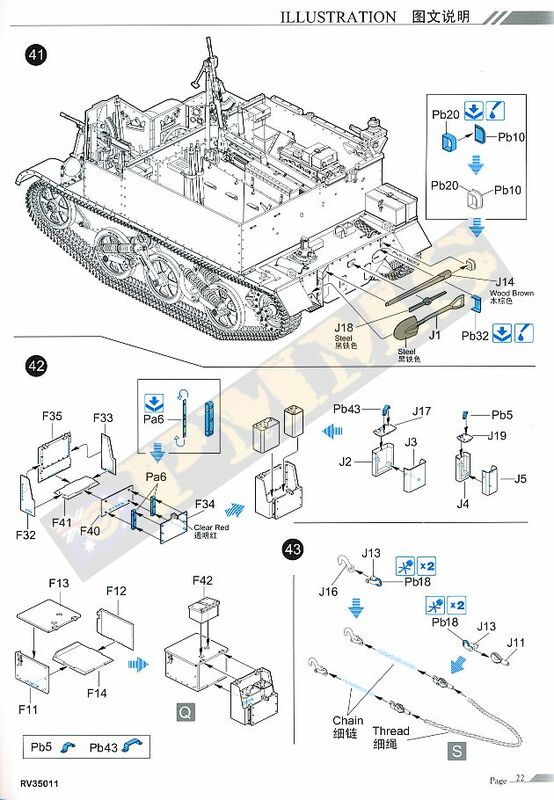 You should now skip forward to step 26-29 and add the central gear shift assembly, the seat attachment brackets (parts B14, B15) plus the additional steering linkages before fitting the seats, these linkages need to be trimmed a little in length as they are designed to fit into holes in the engine bulkhead which won’t be added till later. The seats themselves have the plastic seat pan and cushion with etched legs that can be positioned for the seat in the raised and lowered position along with the larger seat raising lever which needs to be bent to shape to fit into the hull side brackets after the sidewalls are added. Fitting the front crew seats with the side walls and engine compartment attached as per the instructions is very frustrating as there is no room to move or to get glue to the rear outside seat legs, these have to remain unglued. Added to this if you haven’t glued the legs at the correct angle earlier they won’t mate with the very small attachment points. Armed with this hindsight is why I have suggested assembling and fitting the seats to the floor at the very beginning to allow access to the seat attachments from all angles without the walls in the way to make things easier. Assembling the seats in this manner is just a suggestion and won’t affect he final result, you’ll just have a little more work to do in fitting the seats later. Moving back to step 6 the hull sides can be attached and it’s easy to get these lined up correctly using the inside front moulded bolt strips as a guide to align with the hull front plate, the bevelled edges make for a very clean and gap free join. 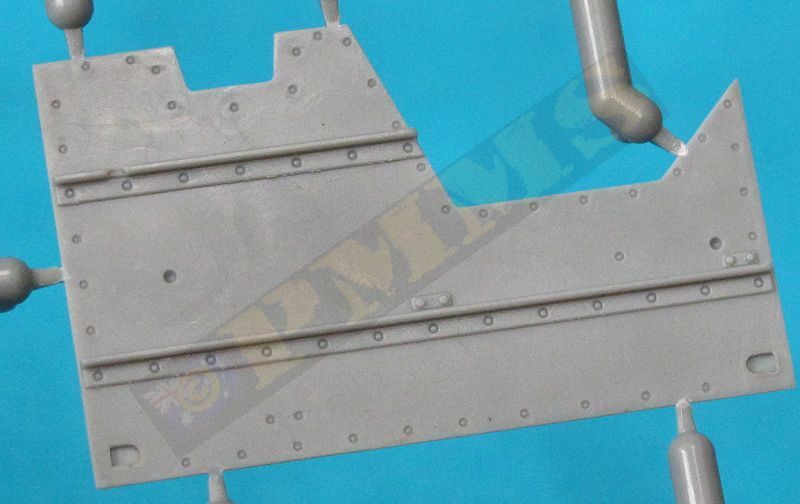 The real hull plate has the two part exhaust mufflers added and the hull plate can be added to the lower hull with the fit again being very good. You just need to make sure the plate is positioned snugly against the rear inside moulded bolt strip on the hull sides for the best fit, this does effect the fitting of the upper hull sides later so is important to get this aligned correctly. 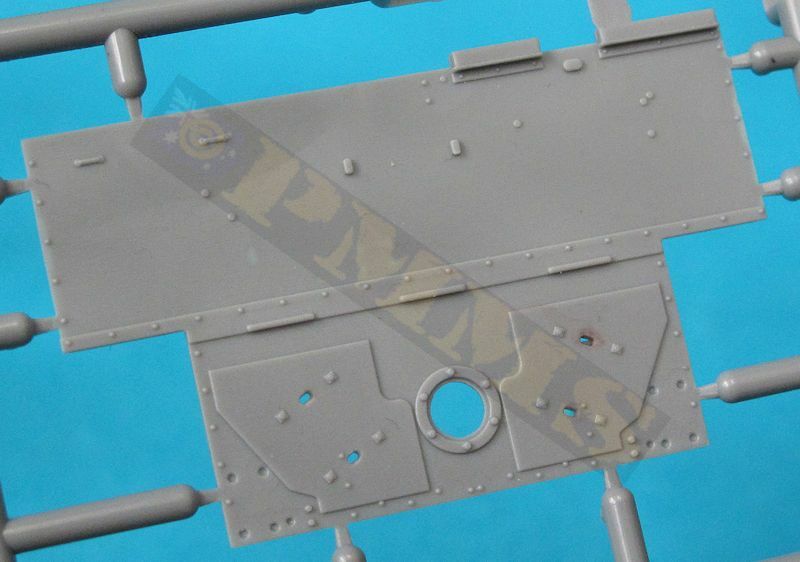 The central floor plates (parts A53, E18) and the radiator mountings (parts G34, G35) can also be fitted at this point as well as the battery and mounting tray which has a few etched parts added for detail. 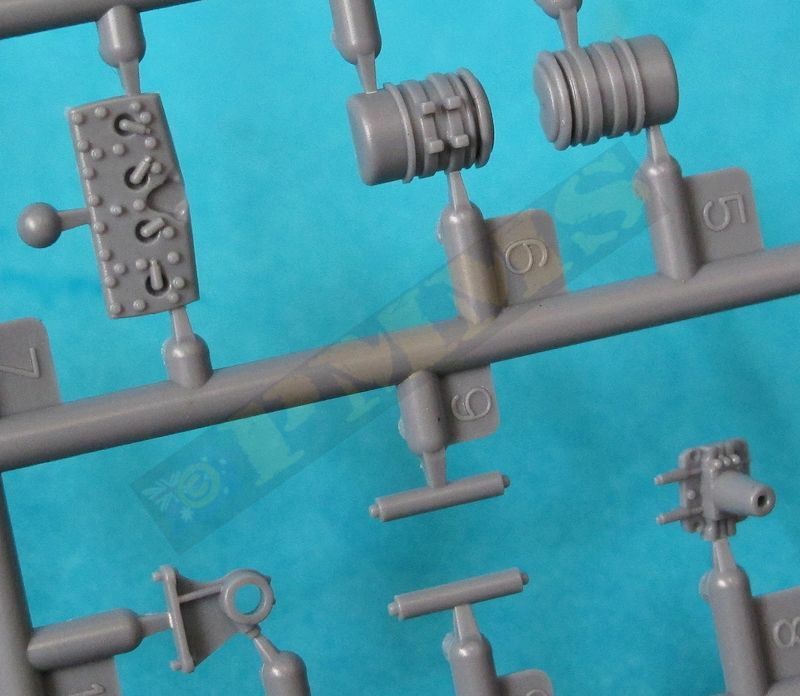 The rear axles and differential are assembled next and unfortunately the instructions indicate to fit the axles on the wrong side of the differential leading to miss-alignment of the parts when fitting to the hull, see the guide here to correctly assembly the axles/ differential. 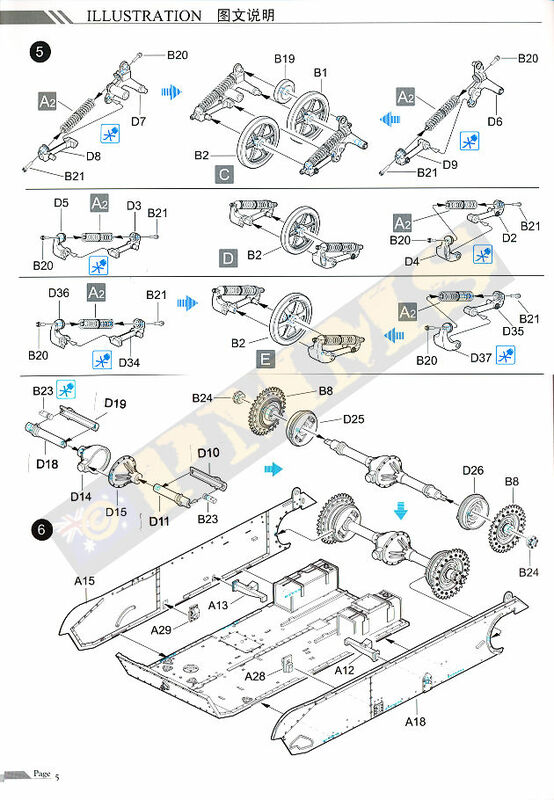 There is an instruction error that will lead to the incorrect alignment of the rear axle and differential if assembled as per the instructions. 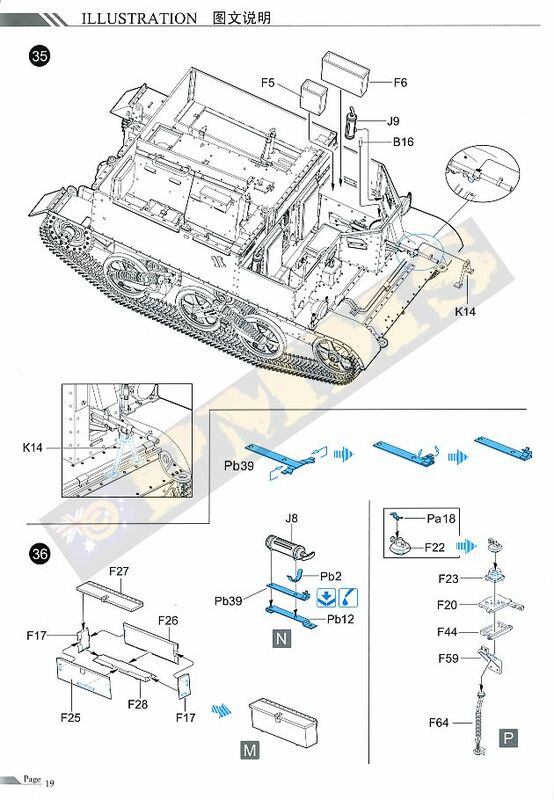 In step 6 the small axles (D10, D11) and (D18, D19) should be on the opposite sides of the differential from what is indicated in the instructions as they are different lengths, parts D10, D11 are slightly shorter than D18, D19. 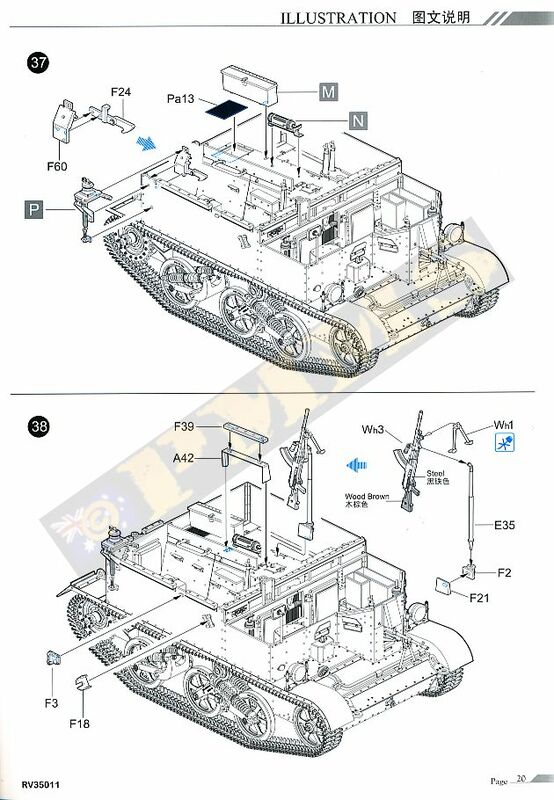 If fitted as per the instructions the differential will not line up with drive shaft on the rear hull wall, also the brake drums will be aligned incorrectly which has implications when fitting the brake connecting rods later. After assembling the axles on the opposite sides but keeping the brake drums as indicated the axle/differentials fit perfectly to the hull, the images show the assembly as per instructions as I didn’t notice the error till fitting the axle assembly to the hull with additional images with the parts fitted correctly on a second kit showing the proper alignment. and the brake drums aligned incorrectly and not mating with the brake connecting rods. with the drive shaft and the brake drums align correctly with the brake connecting rods. 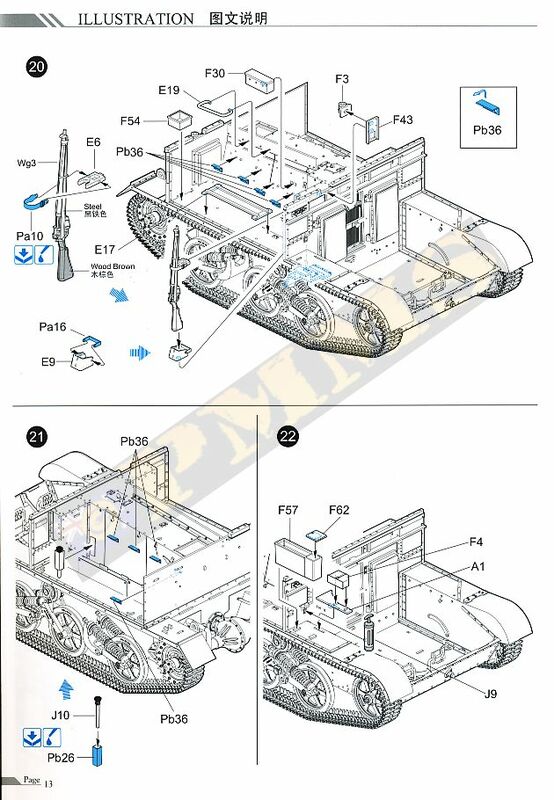 Note: Riich have amended the instruction sheets for this and subsequent kits to show the correct assembly. There is a small axle pin trapped between the two axle halves and this pin must remain unglued for the drive sprockets to rotate but due to the small tolerances it’s not easy to glue the axle halves together without getting glue on the pins. I glued the parts together and the held the axles while continually rotated the pin until the glue has “gone off” and the stub rotates freely. It’s best to have the drive sprockets rotate as this makes fitting the link and length track easier after assembling the suspension. The drive sprockets are nicely detailed with good rim and bolt head details and the correct number of drive teeth and these fit over this pins and held in place with the sprocket hub cap, there fit of the sprocket is not as snug as could be with a little bit of sideways movement but the tracks tend to hold the sprocket in alignment after these are fitted so it’s not a problem. Added on the hull sides are the sprocket ice/mud scrappers and these have two bracket patterns included, one having an additional strengthening rib included with the scrapper in fine etched brass. The fit of the scrapper to the hull is like the rest of the kit very good and the scrapper fits snugly against the drive sprocket. 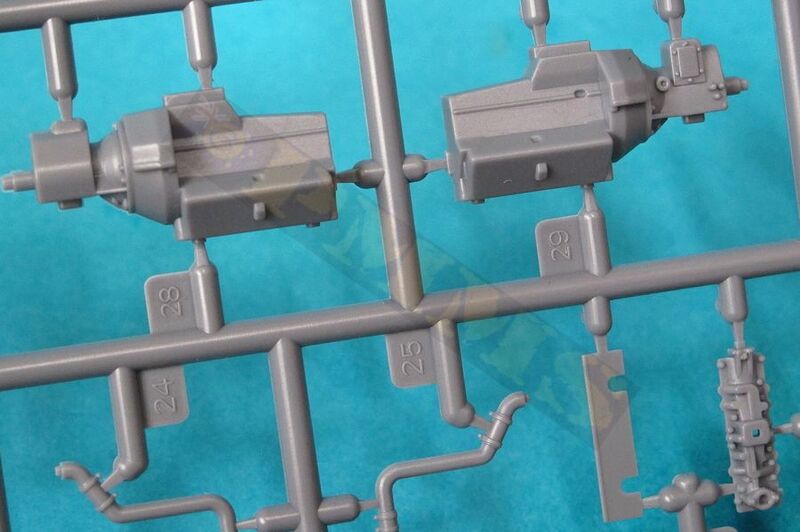 With the axles properly attached to the hull the intricate brake linkages can be added (step 15), these are made up of five small plastic parts each with etched mounting brackets, the parts fit together easily and fit to the hull by way of the etched bracket without any problems for excellent detail definition. The two larger twin wheel bogies have a pair of forks with the main fork that incorporates the upper return roller wheel and secondary fork as separate parts that fit together at the central pivot pin just like the real thing. The bogies aren’t designed to be movable after assembly and the solid track lengths prevent the bogies articulating even if they could. 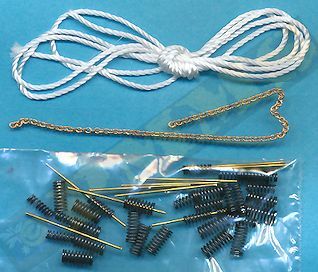 The bogie springs are actual real metal springs with a small inner spring fitting inside a larger outer spring with two of these spring units for each of the plastic spring guide rods that include the central dividing discs with separate end adjustment nuts with two of these units per bogie assembly. You also are provided as an alternative brass spring guide rods with three small etched discs to form the central dividing discs on each rod but removing the etched discs from the fret and the clean-up of the attachment burs for six etched discs per bogie unit (24 etched discs in total) takes nearly as long as assembling the complete plastic bogie and all the extra work doesn’t offer any detail enhancement. 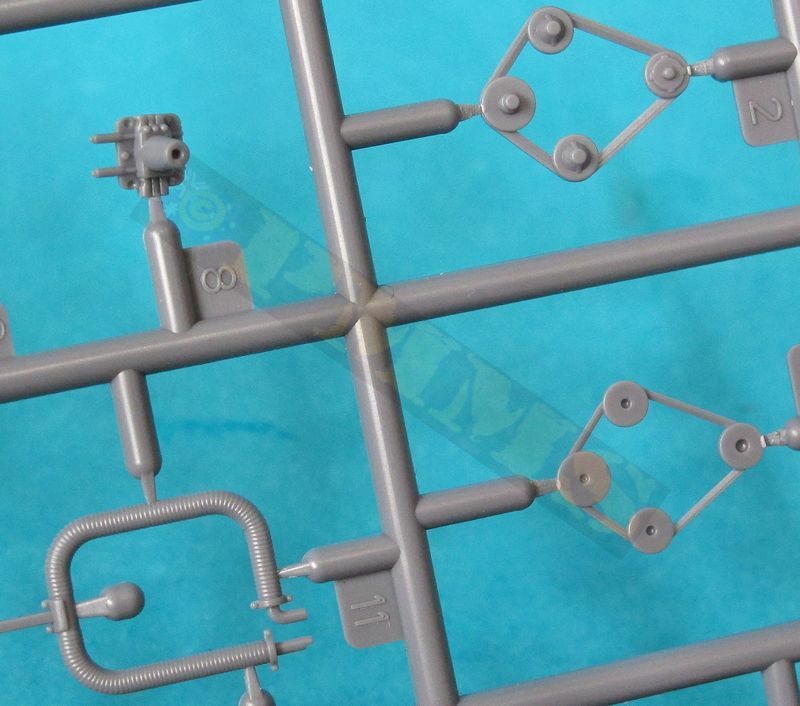 Added to this you need to use two glue types, plastic cement and cyanoacrylate it’s really not worth the effort to use the brass spring guide rods and discs, better to stick with the plastic parts for far easier assembly. Assembly of the bogie units is fairly straightforward with the two forks parts fitting together and then the ends of the spring guides fitted into the holes of the forks to form the basic bogie arm, you may need to slightly enlarge the hole for the spring guides pin and test fitting will determine this. With the two bogie halves assembled you lay the two road wheels and return roller over the axle stubs on one taking careful note of the spoke direction as one side has flat spokes while the other has ribs on the spokes with the flat spokes facing outward when the bogies are mounted onto the hull. 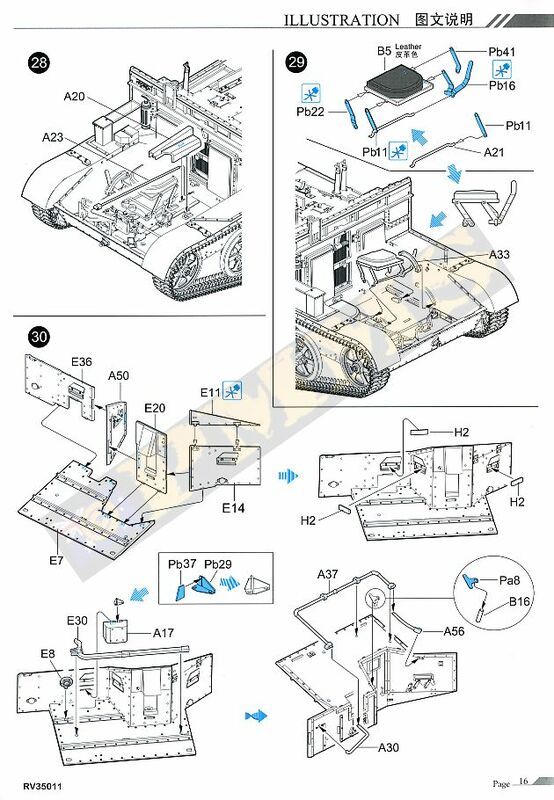 Take carful note of the instructions here to get the wheel spoke direction right, with the wheels attached to one half simply mate this to the other bogie half and glue the central joins, all very easy and this leaves the wheels free to rotate after assembly. 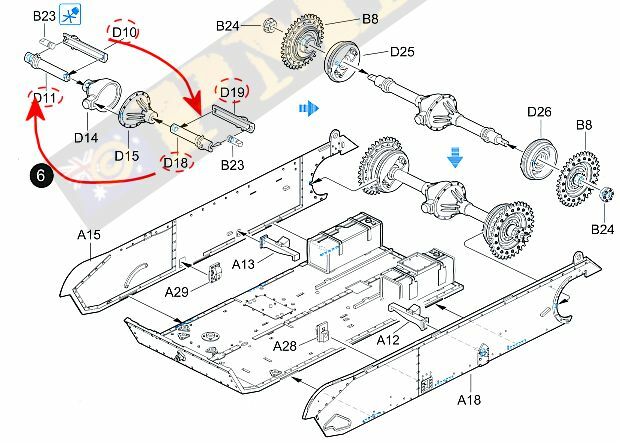 The smaller single wheel bogie assembles in exactly the same manner with the spring units and separate main and secondary forks, there is a join seam on the curved end of the unit to be filled after assembly but that is the only clean-up needed on the bogies. 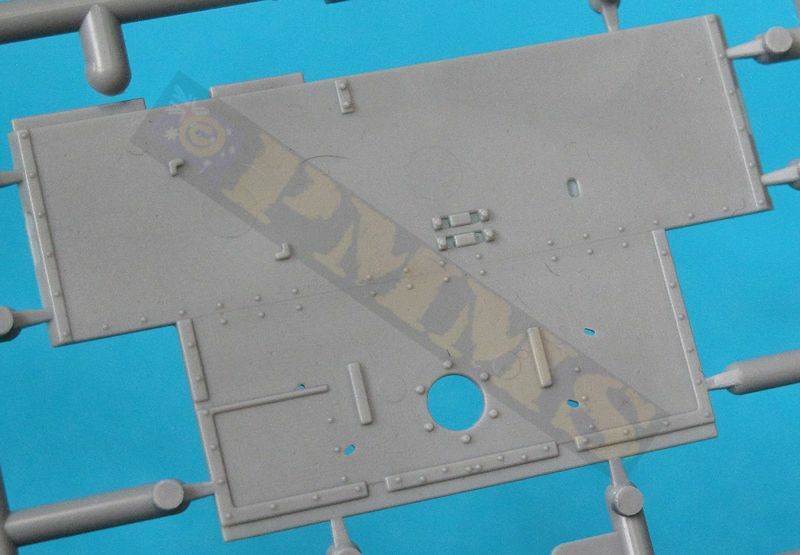 The fit of the bogies to the hull is not as positive as you would like with just a small locating point for each so it is important the wheels are aligned perfectly parallel to the ground line and the glue left to dry completely before proceeding. The bogies main forks also include fine casting data for added detail with the road wheels included fine rubber tyre sidewall embossing and again the detail on the suspension parts is very well done with minimal to no flash to contend with. The front idler housings are the British pattern and have excellent details and it should be noted the Canadian pattern idler housings are slight different but as these differences are mostly hidden behind the idler wheels it’s probably not a big issue if building the kit in one of the Canadian marking options provided. The idler wheels are attached to the housings by way of a small pin and careful gluing will see the idler wheel rotate after assembly. One small issue when fitting the idler mountings, the left side mounting fitted okay over the raised locating ridges but the right mounting needed the front part of the locating ridge trimmed off for the mounting to fit properly. 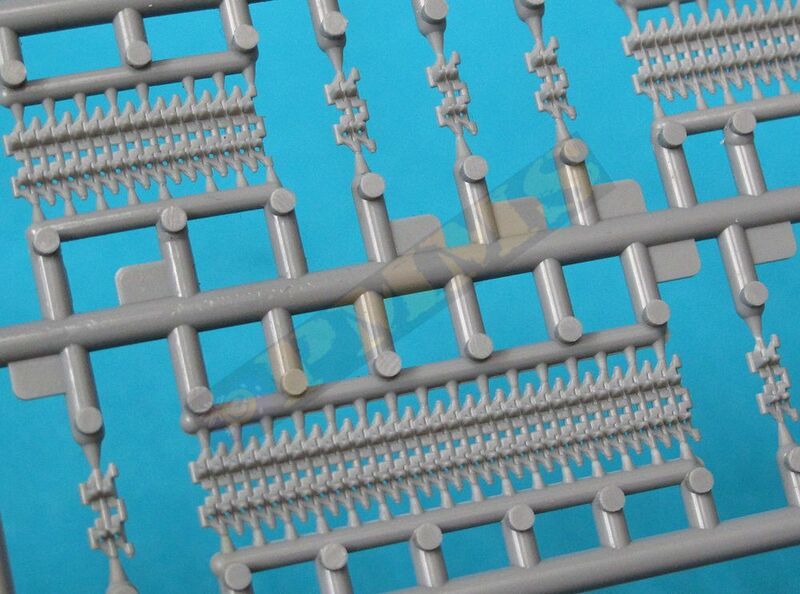 The track is provided as moulded link and length with longer sections for the top and bottom runs and shorter sections along with individual two links sections for around the drive sprockets and idlers. The track is moulded virtually flash free thankfully as excessive cleaning up these small links would be a nightmare, also the top rear track length has the subtle sag as seen on the real vehicle. 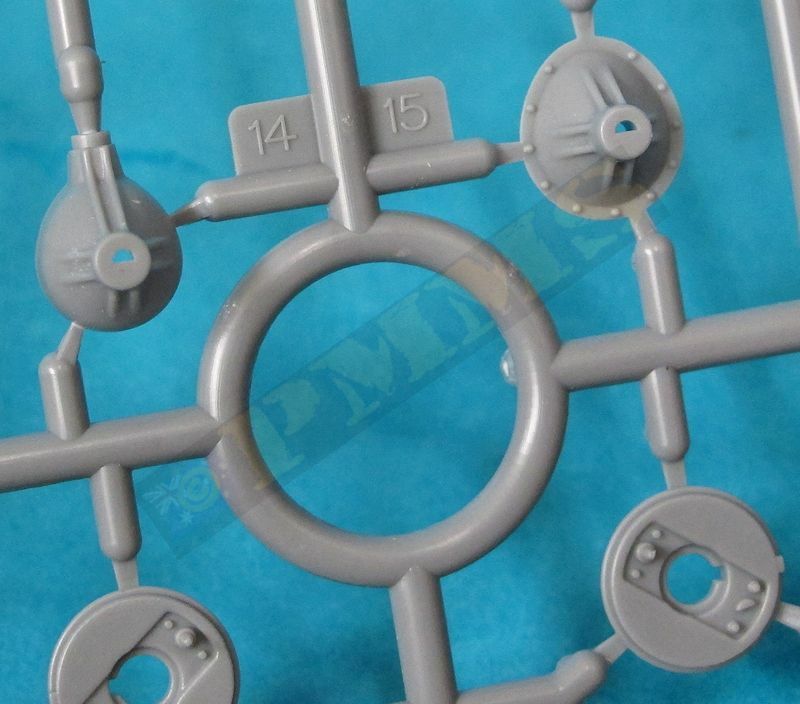 There is one small issue to contend with, the sprue attachments are right on the end track pins and you do need to trim these a little taking care not to trim too much just leaving the pin, using the pins without the sprue attachments as guides for the trimming, this does take a bit of work but nothing more than usual for the this type of track. Fitting the tracks is quite easy, with the two link sections for around the drive sprocket and idlers best glued separate and once the glue has “gripped” the links and no longer sticky the links can be bent around the idlers/drive sprocket and left to dry completely before proceeding as it makes fitting the tracks easier if these link sections are solidly glued together. 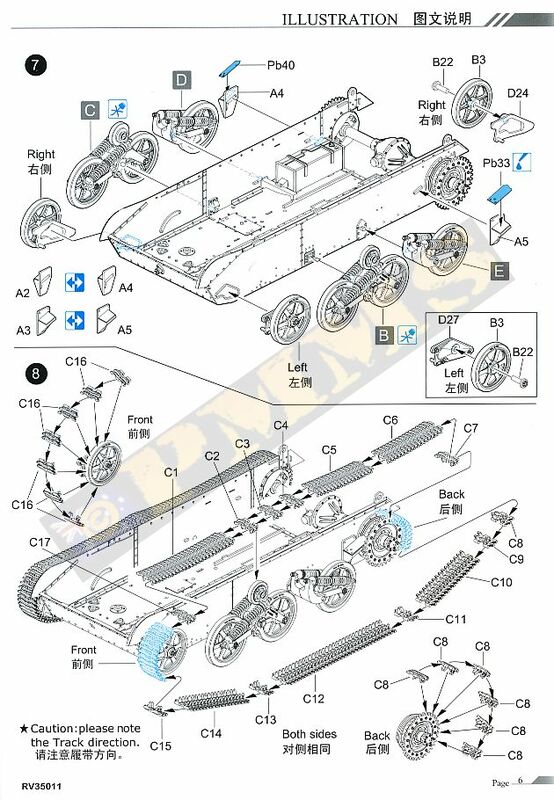 It’s best to start by fitting the track to the sprocket teeth and from there fit the other sections as indicated in the instructions for the lower ground run and up to the idler track section, having the drive sprocket left to rotate helps significantly in the fitting of the track as minor re-position will be needed to mate to the sections that are fixed in relation the curve under the first and last road wheel. Fitting the top track sections is next and the longer sections have subtle sagging included with three shorter section that go over the return roller and positioning these to give the right amount of curve is easy enough and once positioned the track should be left to dry before proceeding further. One thing to note I have to cut off one link from one of the two link sections to get the best fit and I did this at the underside drive sprocket track join as you can use one of the sprocket teeth to hold the links together better than elsewhere in the track runs. I also didn’t permanently glue the track to the curved section around the drive sprocket as this allowed the tracks to be removed after the glue had dried completely for easier painting and then re-fitted to be glued during final assembly. I also didn’t fit the tracks when indicated in the instructions but left these till after most of the main hull had been assembled to not damage the tracks during handling, this also meant the fenders couldn’t be fitted till later as the tracks need to be added to the suspension before the fenders as it’s difficult but not impossible to fit the tracks with the fenders attached. I actually fitted the fenders just before fitting the glacis/front hull plate and the fit of the fenders was again perfect due the bevelled edges giving a gap free fit. 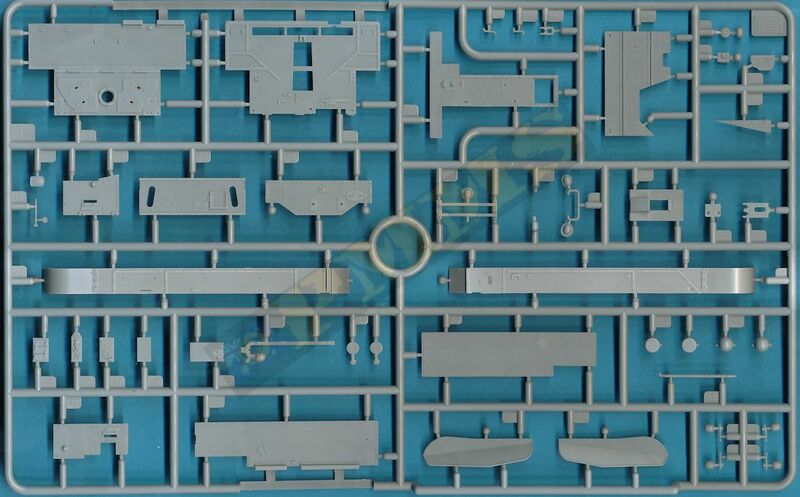 This is a multi-part sub-assembly with excellent surface details on the compartment walls and especially the front bulkhead; the fit of the parts is again excellent without any trimming or filler needed. The top intake mesh is provided in etched brass and has the fine square pattern which is correct for the Mk.I, the Mk.II had diamond pattern mesh for this intake. The front bulkhead has the engine oil cooler piping added to the rear side although only a small part of this can be seen after assembly and on the front it has openings for the radiator and top intakes as well as the embossed FORD name which is not evident in any of the period photos I have seen and can easily be shaved off. The crew seat backs and fire extinguisher are also fitted to the front of the bulkhead which can be fitted to the rear compartment assembly to complete the main compartment assembly. Added to the sides are two large etched panels to provide the thin lower wall section that fits over the floor radiator mountings. 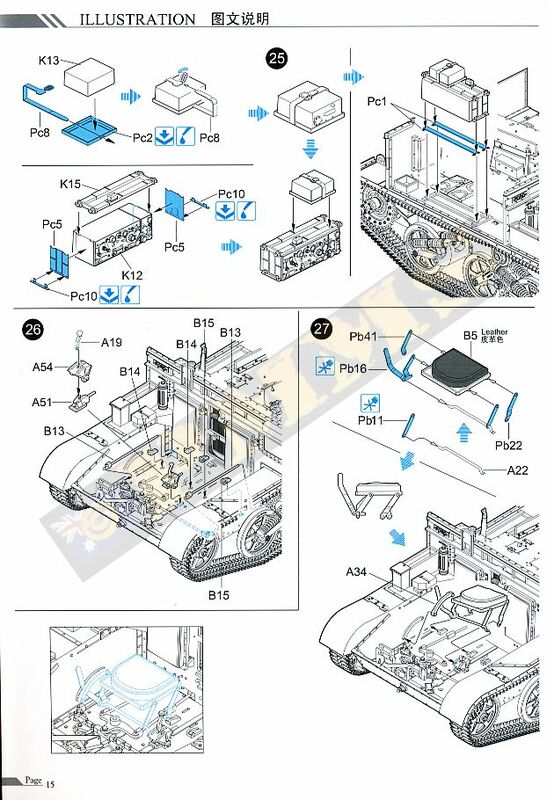 The instructions would have you fit the engine compartment into the hull after the basic assembly but it is easier to fit many of the smaller detail items before fitting into the hull for ease of access. 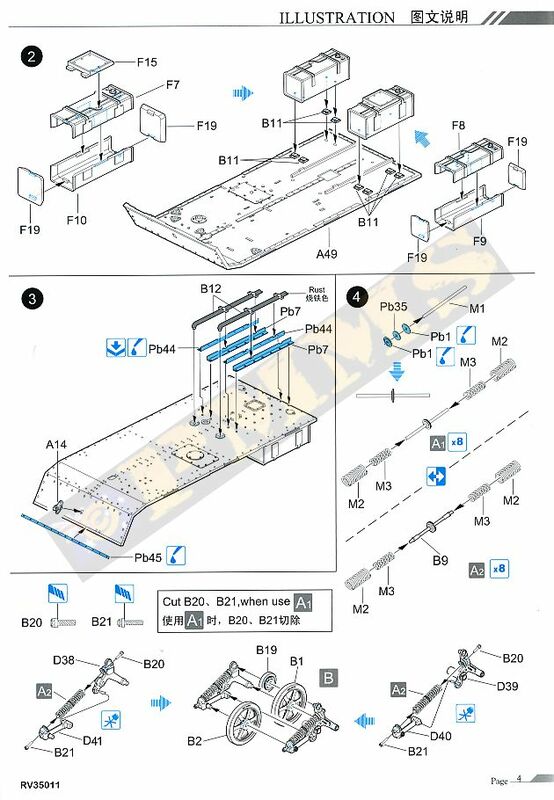 This specifically applies to the eight small etched brackets (parts Pb36) shown in steps 20, 21 and the right side etched seat bracket (part Pa7) in step 19 as these are quite difficult to fit with the compartment inside the hull. Other details such as the fire extinguisher with etched mounting bracket and the small storage box shown in steps 36, 37 are also easier to fit with the compartment separate. The other etched seat bracket (part Pa2) is also easier to fit to the right hull side without the compartment fitted as there is more room to get the part aligned correctly, all these brackets have to be bent at a right angle which is very easy with a good bending tool. The fit of the engine compartment inside the hull is very snug to say the least and a bit of manipulation may be needed, you also need to insert it slowly as there are a few areas where it can become ‘hung up’ such as fitting over the two floor support brackets (parts A12, A13) and over the radiator mountings and the rear wall raised guides but with due care the final fit is superb and will happily stay in place without gluing such is the good fit. As mentioned above I actually left the engine out of the kit as it can’t be seen after assembly and just fitted the radiator onto the floor mountings, the location of the radiator on the mountings is clearly indicated so there is no problem fitting the radiator correctly if not attached to the engine. One small thing is the rear compartment walls weren’t spayed enough and wanted to get caught on the rear hull wall locating lugs so I fitted a plastic strip spacer to make sure the compartment sidewalls were at the correct angle/spacing for easier fitting as it is very difficult to splay the panels out while fitting due to the limited access in the tight confines of the hull. This spacer can only be used if not fitting the engine as it will foul on the air cleaner if used when the engine is installed; in that case you need to make sure the side compartment panels are splayed out enough to slip over the raised guides on the rear hull wall. 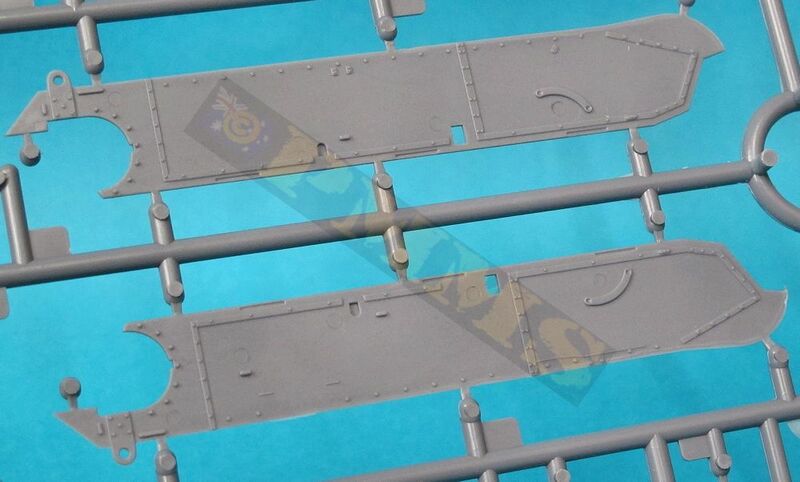 The front hull plate is made up of five sections with bevelled edges for a flush panel fit and are also attached to the rear of the glacis with again the fit being excellent so long as you make sure the panels are aligned correctly as there is scope for miss-alignment given you are fitting the front plate panels together while at the same time fitting to the glacis contours. There are three clear plastic armoured glass blocks in the vision ports as well as a very small two part etched vane sight on top of the steering wheel recess cover plus the rather flimsy rear view mirror which would be advisable to leave off until last to avoid damage. Added inside the plate is the three part instrument panel with finely raised dial and switch details and the assembled panel glues easily to the rear of the front plate. 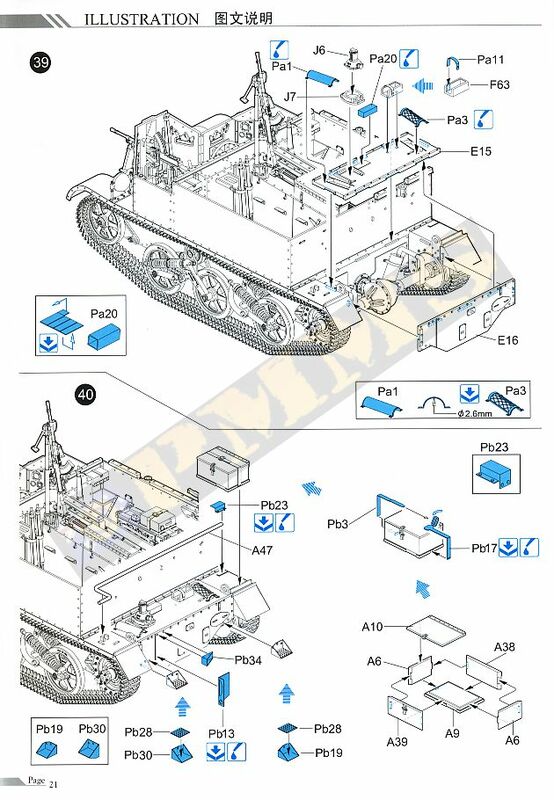 The Military Vehicle Workshop book listed below indicates there is a different design of the Mk.I and Mk.II instrument panels with the kit instrument panel matching the book illustration of the Mk.II instrument panels. 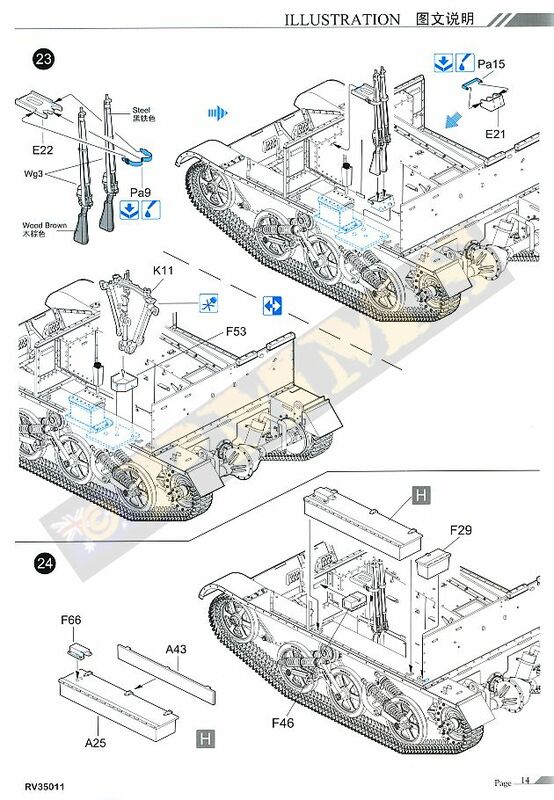 The Watson Universal Carrier books on the other hand has illustrations indicating the T-16 Carrier Mk.I used an instrument panel shown in the MVW book as being for the UC so there may be a mix-up of vehicle types with the MVW information. 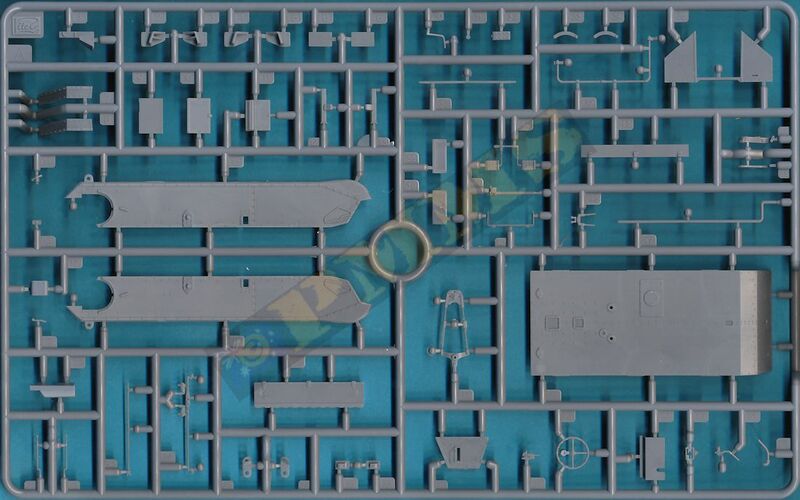 The instrument panels are hard to see in many period photos but where it can be seen on UC Mk.Is appears to match the panel in the kit, so all of the above may have been just a bit of thinking out loud, if anyone has additional information I’m happy to be educated further. When fitting the Bren Gun to the front panel weapons opening you have to fit the gun mounting pin into the pivot bracket (part F1) and fit the bracket with the gun to the front plate at the same time as it’s impossible to fit the gun mounting pin into the bracket with the bracket already glued in place without cutting down the mounting pin until it fits into the bracket. 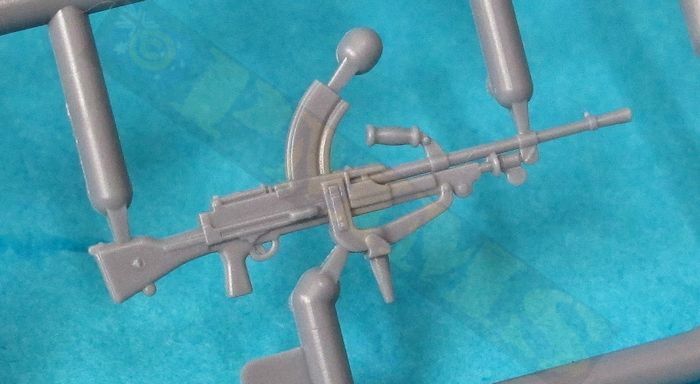 I guess either way will work because the cut down mounting pin will still secure the gun in the bracket if you choose to fit the gun later after painting. 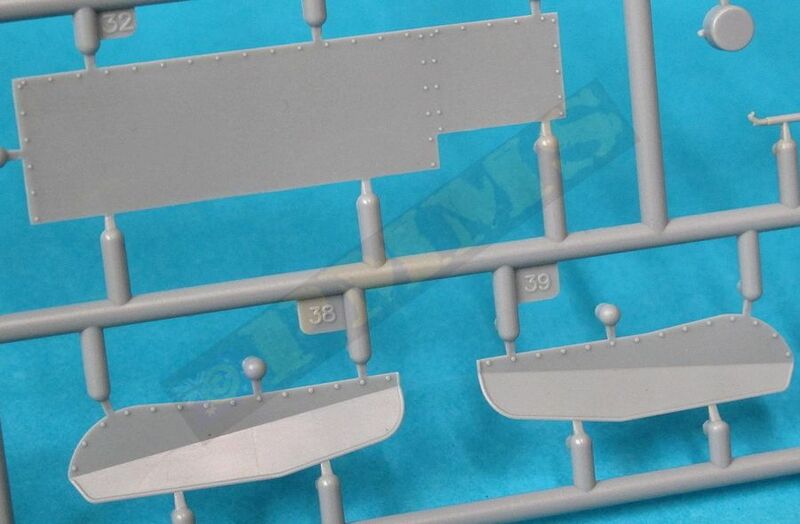 The glacis has excellent details such as the flush screws and bullet splash guards and again it’s best to fit the smaller details before fitting to the hull for easier access, these include the track adjustment wrench, horn and steering wheel recess cover plus the two towing brackets on the front corners. 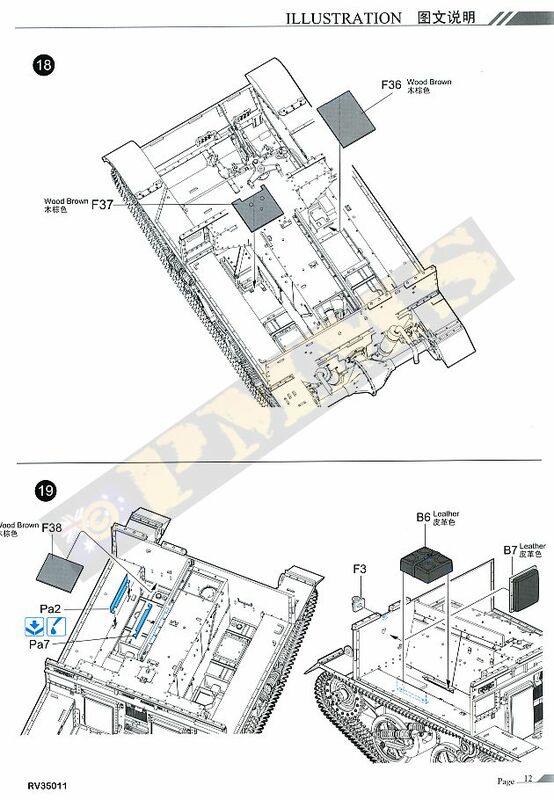 On the inside is the three part electrical ducting under the glacis which apart from the end sections is hidden after assembly, there is also another fire extinguisher and etched strip on the left side. The fit of the glacis/hull front to the lower hull is again excellent with notches under the front of the glacis that fit into recesses in the lower hull to give the correct amount of glacis overhang, you need to make sure the front plate sits snugly against the raised bolt strips on the fenders but again the fit here was spot on. The final main hull parts to be fitted are the two hull side panels these again have bevelled front and rear edges and these fitted superbly to the rear plate and front hull plate without the slightest hint of gaps or the need for any filler, to get this good fit you do need to make sure the rear and front hull plates are fitted precisely in position against the moulded on bolt strips on the respective parts as mentioned above. 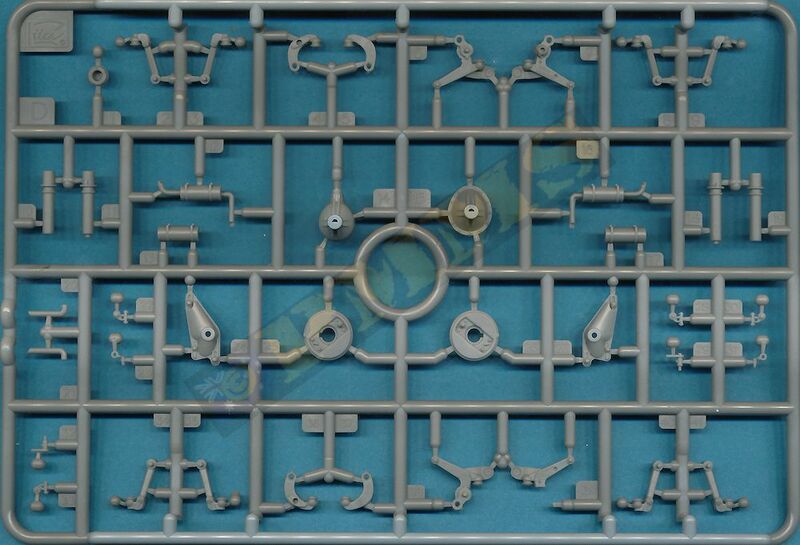 I have to say the fit of all the main hull panels on this kit were some of best I’ve seen on any kit without the slightest hint on gaps or other miss-alignments and goes a long way to making the assembly stress free, which is helpful after some of the intricate sub-assemblies along the way. 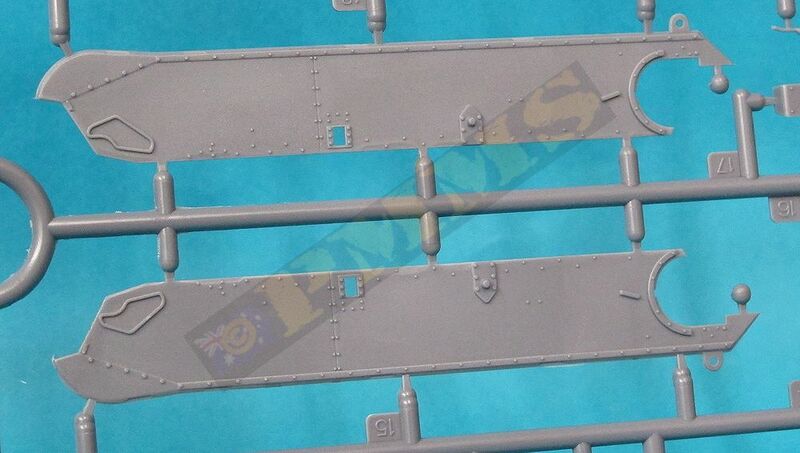 Added on the right hull side is the intricate No.11 radio aerial made up of eight plastic and one etched part and all that is needed is the aerial and cable to the radio inside the hull, there is also the mounting for the 4-inch Smoke Discharger but strangely not the discharger itself. As the markings option 1 should be fitted with the Smoke Discharger you will need to source this elsewhere to use. The two rear hull plates can now be fitted and again it’s advisable the fit the smaller detail parts the panels before fitting to the hull for ease of handing, these included the two etched curved silencer guards on the upper panel that need careful bending around an appropriate sized drill bit as well as etched steps and tool brackets on the lower panel. The fit of the two panels was again superb without any gaps making for trouble free assembly. 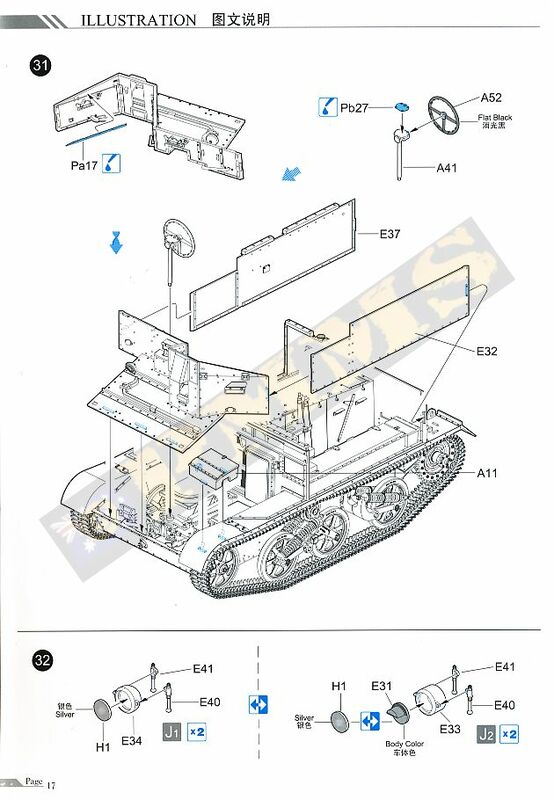 The large battery and storage box on the rear hull are again made up of multiple parts with bevelled edges for seamless assembly as is the small can rack mounted on the battery box. The front plate on this rack has a etched strip mounting that needs to be bent to shape and it’s best to glue the strip to the three locating pins on the plate before bending the curves as this helps get the two strips bent equally for the proper sit of the panel when fitted to the box. The two small ‘flimsy’ cans are in three parts with etched handles and these fit neatly into the rack without any problems. 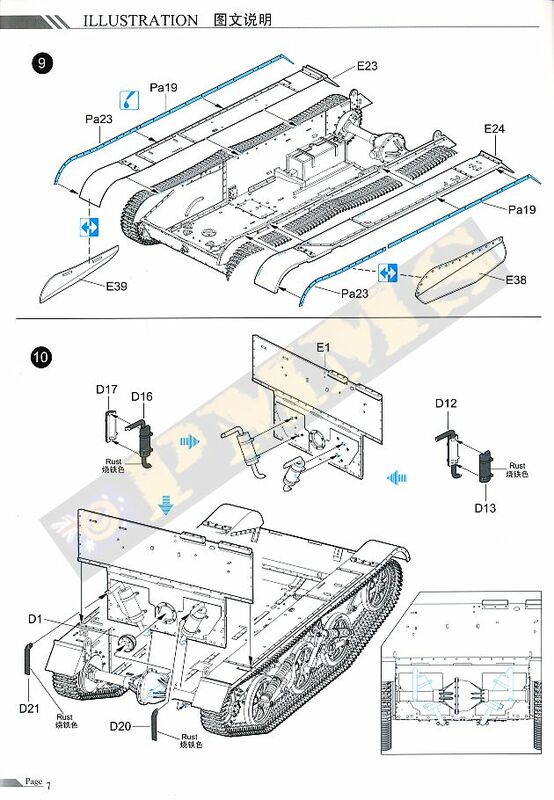 The pioneer tools can be added to the rear plate along with the various etched mountings and there is also a fairly complicated tow cable/chain assembly that is stowed around the two small brackets (parts B18) on the lower rear hull. 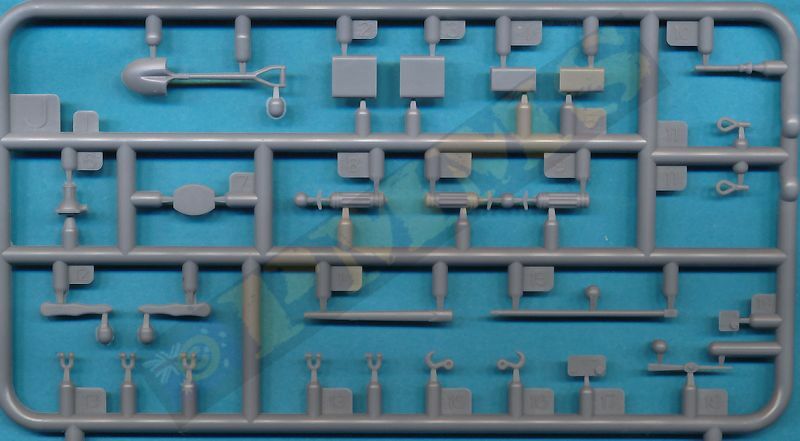 The cable consists of eight very small plastic parts for the hooks, cable eyelets and U bolts plus four small brass rings, short lengths of fine chain and the twine for the tow cable. The instructions don’t indicate the length of chain or cable but the chain should consist of 14 links but I don’t know the exact length of cable and an educated guess based on the illustrations would be best. 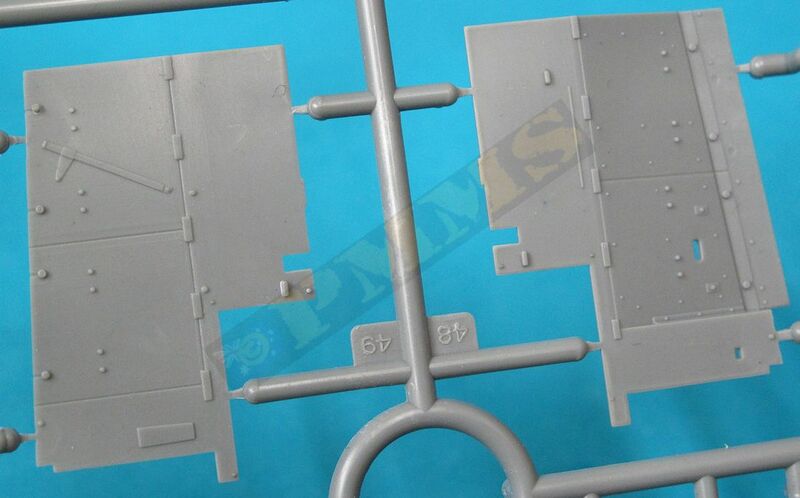 With the main hull assembled the numerous smaller storage items can be added as per instructions inside the vehicle, there were no problems with any of these but you need to make a choice of twin rifle racks or the intricately moulded Bren Gun Tripod stowed in the left rear hull as they both can’t fit. 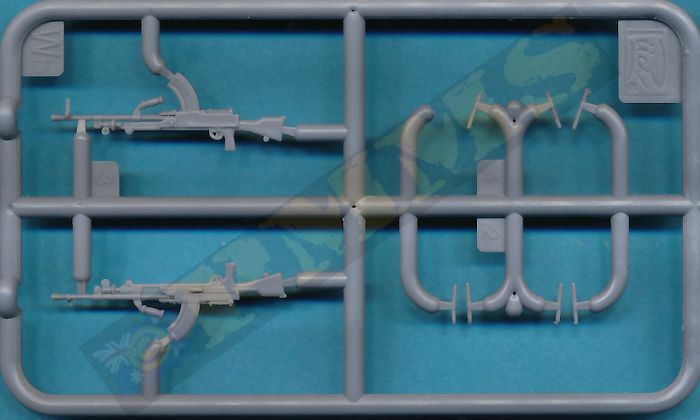 There are two rifle racks, the double in the left compartment and a single rack in the right compartment, these have etched straps holding the rifles in place and you need to glue the rifles into the floor brackets and slip the top retaining bracket down over the rifle and fit into the small wall slot provided. 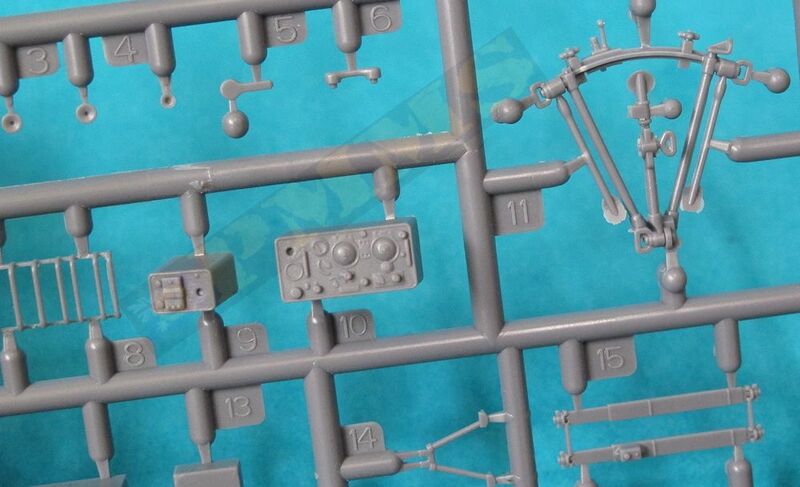 The kit includes a No.11 or No.19 radio set but there is only the No.11 aerial mount provided and not the appropriate No.19 aerial bases so it’s best to use the No.11 radio unless you specifically want the No.19 radio sets then you will need to find the aerial mounts elsewhere. Just a note on the No.19 radio this comes with a choice of fine plastic or etched grill guards with the fine plastic guards have a better 3D appearance than the flat etched guards. 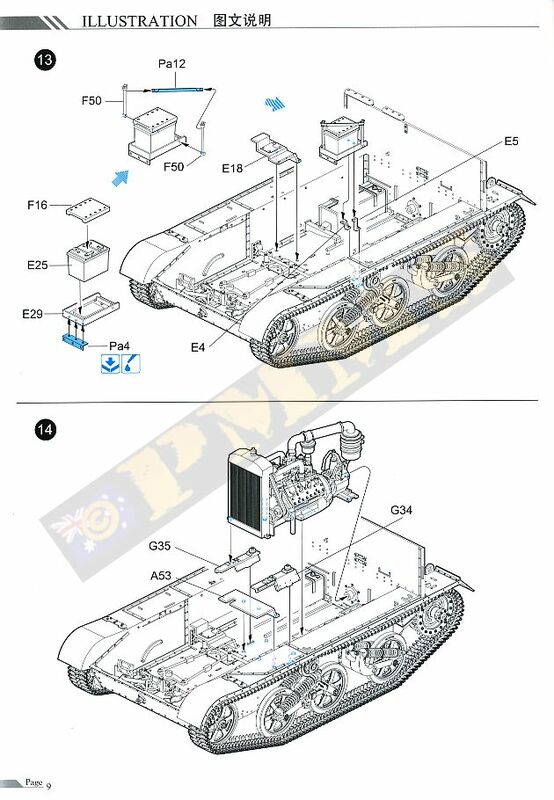 Mounted on the front fenders are the headlights with the appropriate Mk.I mounting posts, you are provided with alternate headlights for the British produced Carriers or those for the Canadian produced Carries although the instructions don’t indicate which is which, only that you have a choice. 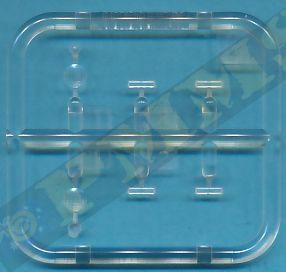 In short the British lights are parts E34 and the Canadian lights parts E33, on both you can use either clear plastic ‘glass’ or the blackout light cover, most images show the blackout cover on the left headlight only when used but of course this is not a hard and fast rule. You can add the wiring from the electrical outlet on the front plate to the light to add additional detail if you wish. 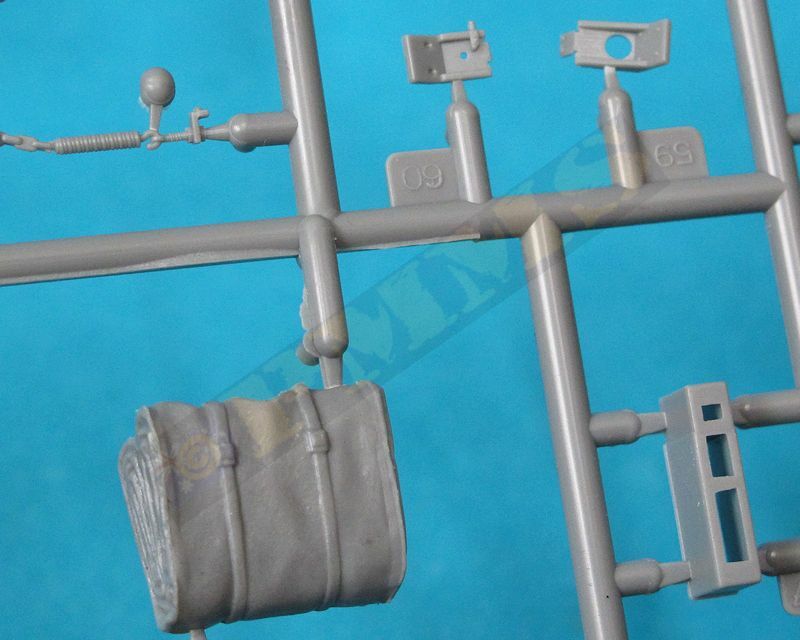 The AA Bren Gun mounting post is provided and can basically be used on any of the four weapons mounting brackets located on the engine compartment and around the top edges of the hull panels, the position of the AA Bren is really up to you. 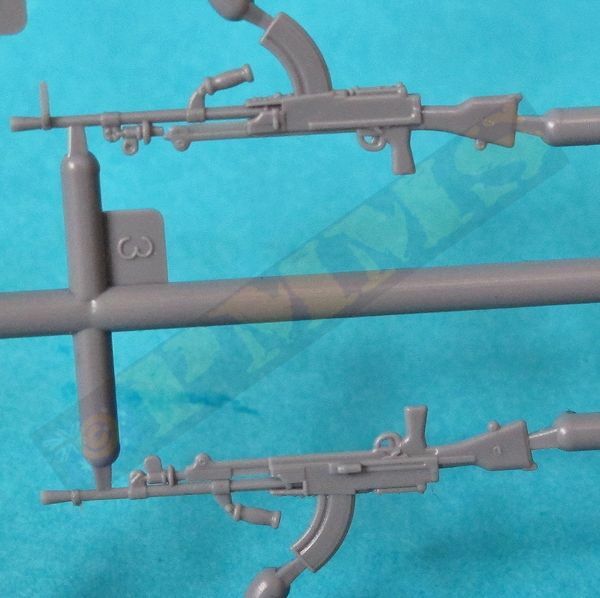 Details on the Bren Gun Mk.IIs is nicely done with the magazine included along with the top carry handle and the muzzle is slightly hollowed out although drilling this a little more will give a better appearance. 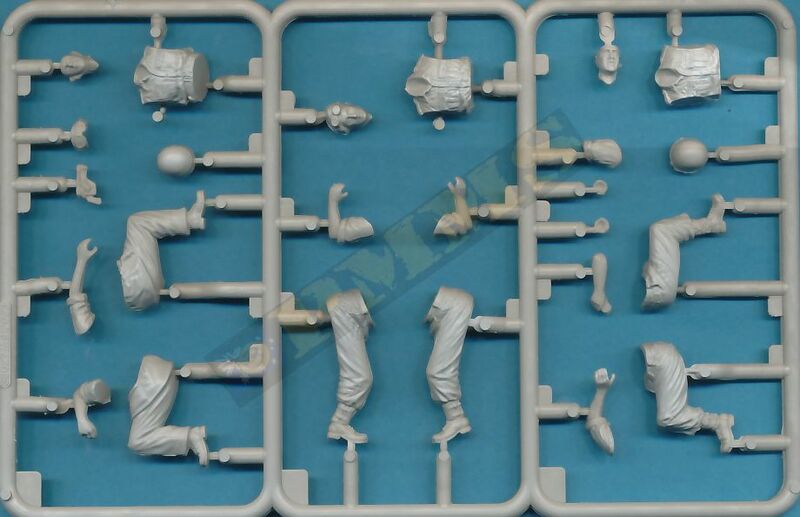 The three seated crew figures provide the driver, gunner and radio operator and are quite nicely done with good uniform details overall although the large moulding seams compromise the detail in some areas and the facial features are a little basic, especially the ears that are just blobs on a couple of the figures. 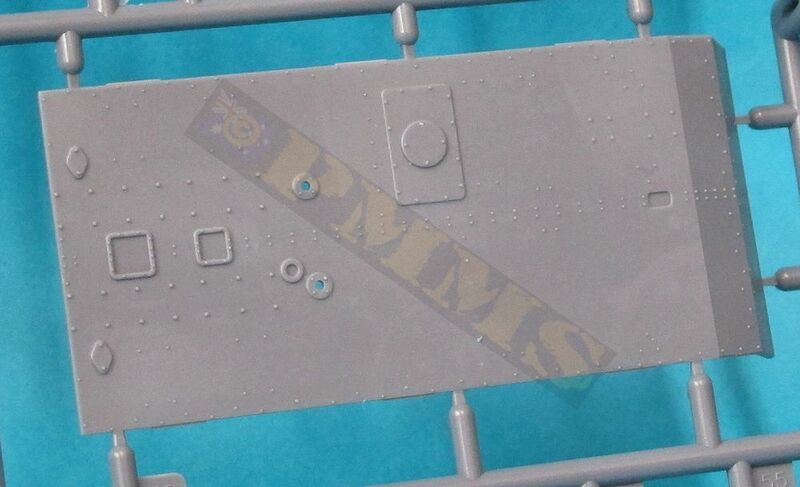 These are broken down in the usual manner and come with the small decal sheet for rank insignia. 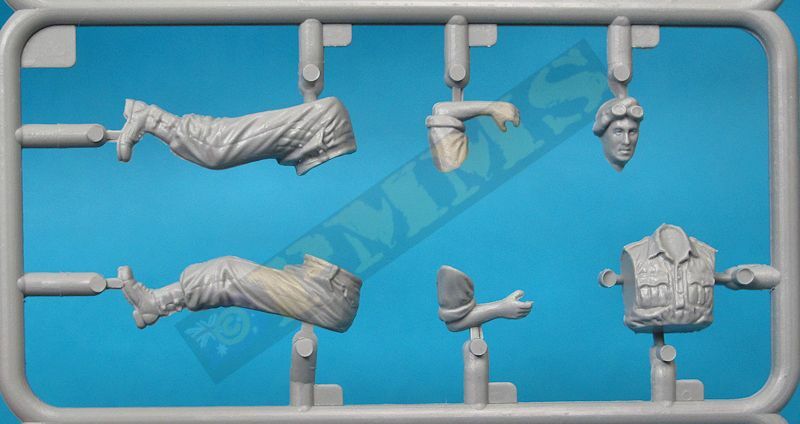 Fitting the figures into the small confines of the hull will require a few variations from the instructions. 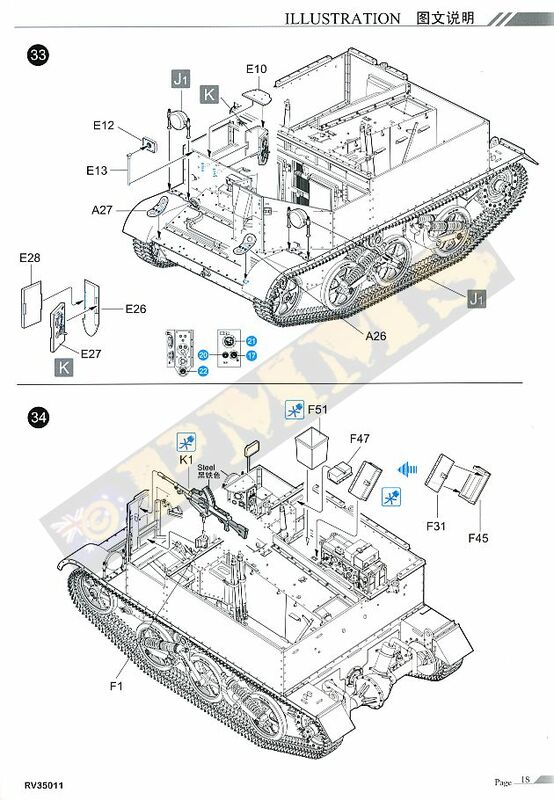 The rear radio operator will fit into the rear compartment but has to be fitted before adding the radio, this and the mounting base (part E17) will need to be fitted about 1mm forward of the actual position shown in instruction steps 20 and 25 to allow room for the operator's right arm to fit. 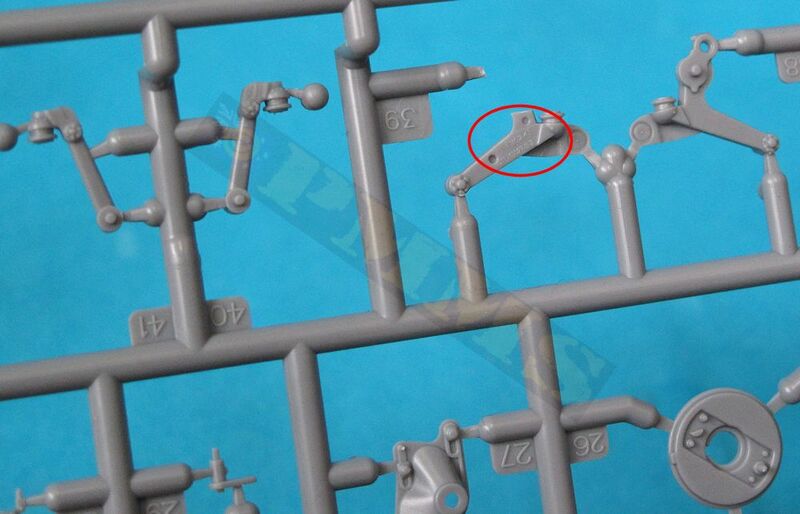 You will also need to leave off the grab handle (part E19) as the figure will not fit into place with the grab handle attached. Unfortunately the grab handle will not then fit in the appropriate position with the figure in place so you may have to relocate this forward or leave off? The driver will need to be fitted during construction of the driver's compartment as it's not possible to fit after assembly is completed but I wasn't able to test fit the figure due the kit being fully assembled. 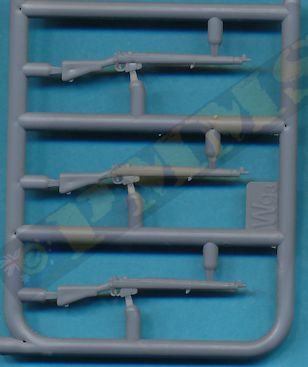 The gunner figure is not designed to fit into the compartment with the Bren gun as there simply is not enough clearance between gun stock and seat back to fit the figure. 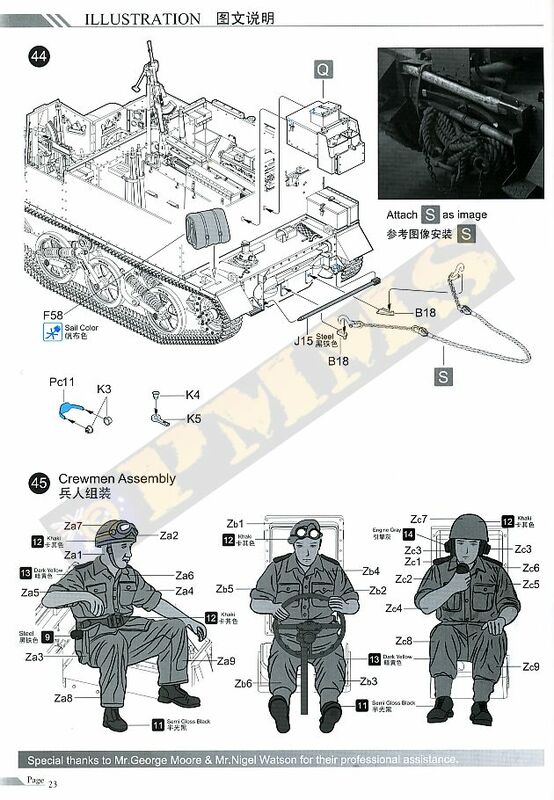 Instead he should be mounted sitting on the left side storage containers with left hand on the front armour plate and the right arm resting over the engine bulkhead, the right foot just 'hangs' in the air which may not be that noticeable unless you peer into the compartment with the left foot sitting on the hull sponson. 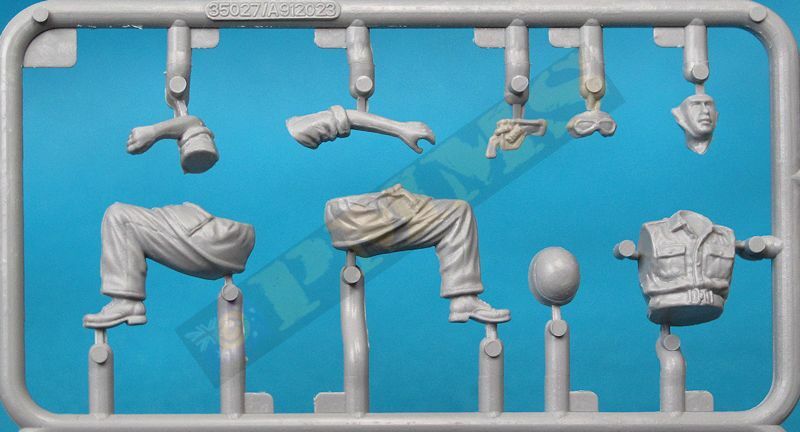 Overall the crew populate the kit quite well to use in a diorama setting. 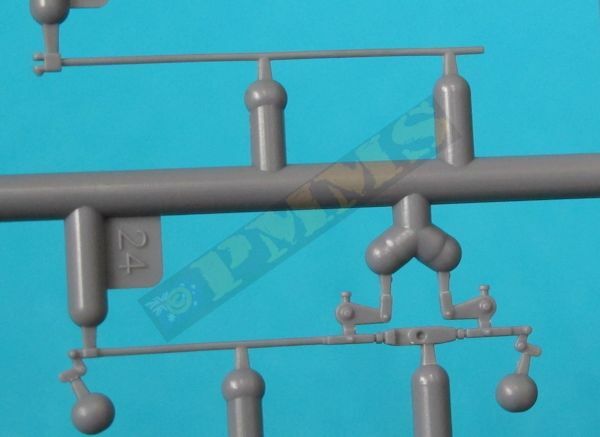 The small decal sheet is well printed with markings for 4 vehicles with a selection of unit markings and some smaller markings, the smaller decal sheet has rank insignia for the figures. 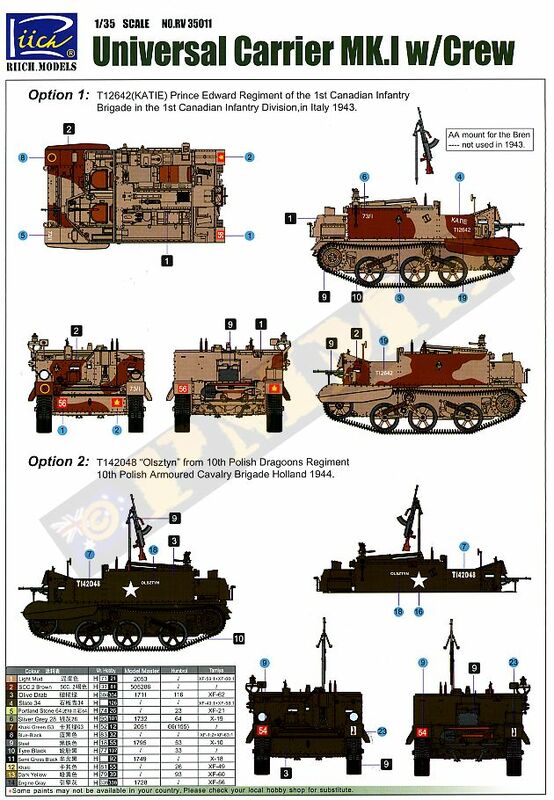 Note; references indicate the correct colours for this vehicle should be Light Mud over Dark Green G3 (right) and not the Brown as shown in the illustrations (left). 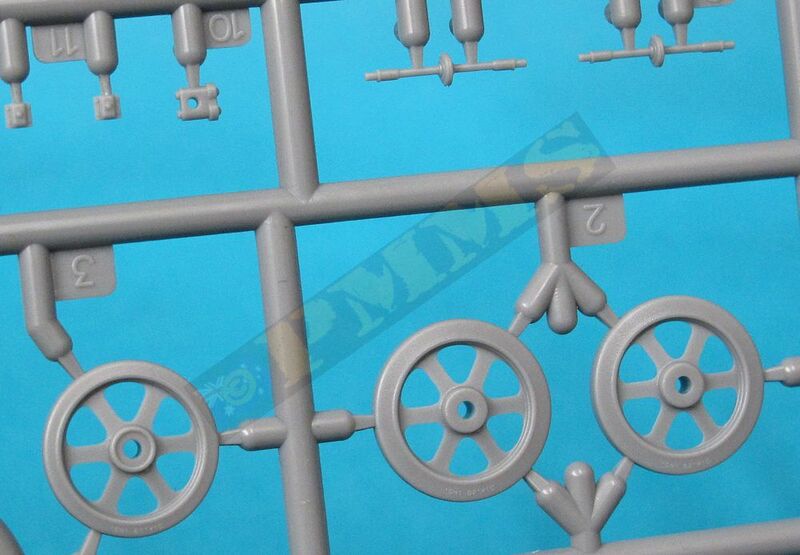 This vehicle should also have the 4-inch Smoke Discharger mounted on the right hull. Finished in overall Dark Green. Was in the standard Caunter Scheme of Silver Grey (BSC 28), Slate (BSC 34) and Portland Stone (BSC 64). This vehicle was Khaki Green G3 with Black disruptive pattern and carried a spare road wheel on the left rear plate. 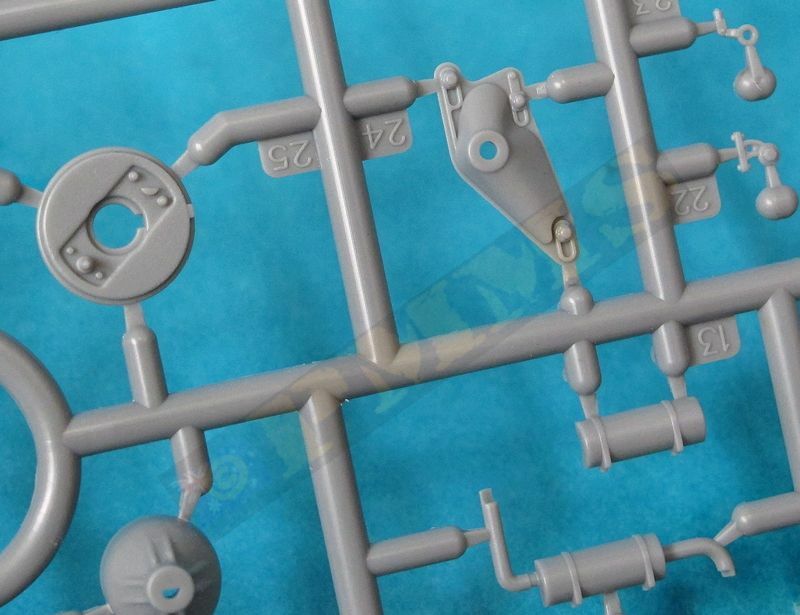 This is simply an amazing kit by any standards; the quality of the plastic moulding is very clean with crisp clean details included on both sides of the hull panels as well as most other parts. 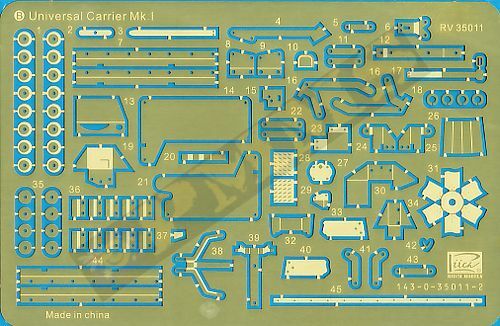 The kit captures the unique features of the Mk.I very well as well as providing options for the head lights and fender layouts plus the superb rendition of the Ford V8 engine, it’s just a pity this is totally hidden after assembly and leaving this out will reduce the assembly time. 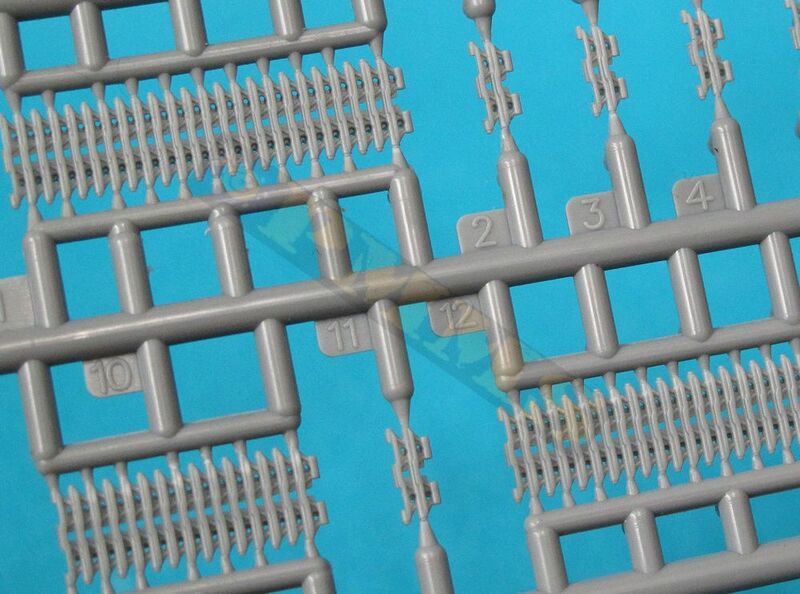 The suspension is also very well done with the metal springs adding nice detail definition to the assemblies with the link and fine length track being well done for plastic tracks. 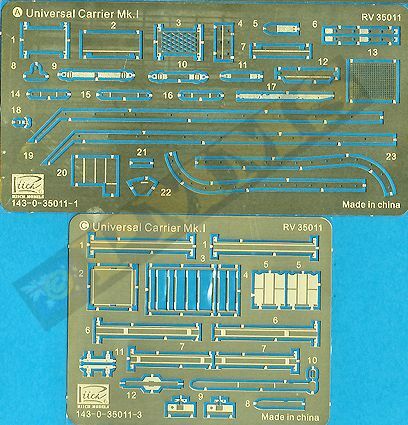 All of this excellent detail enhanced with numerous small etched parts and superb fit of the parts does have a cost and that is the kit will need your undivided attention as there are some very intricate and detailed sub-assemblies to contend with and as mentioned the kit is not for the inexperienced. 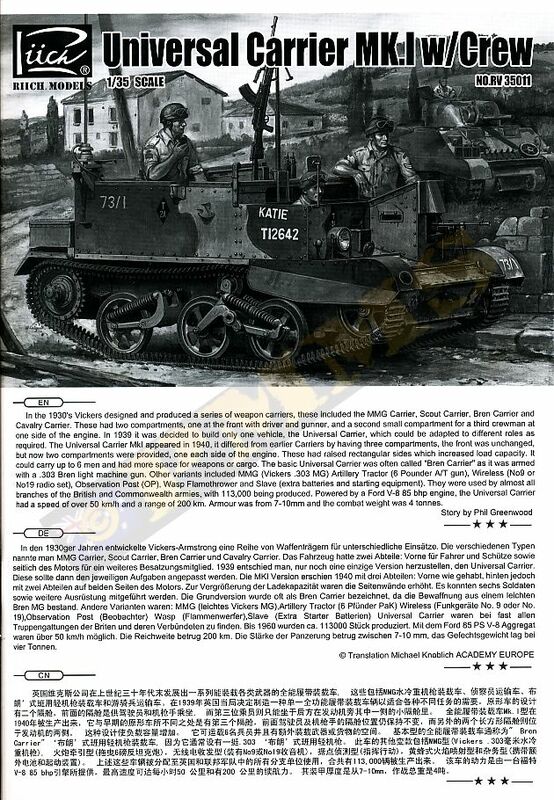 But if you want what is without doubt the best kit available of the Universal Carrier Mk.I available today then this is it with the finished result simply outstanding in detail and presentation. 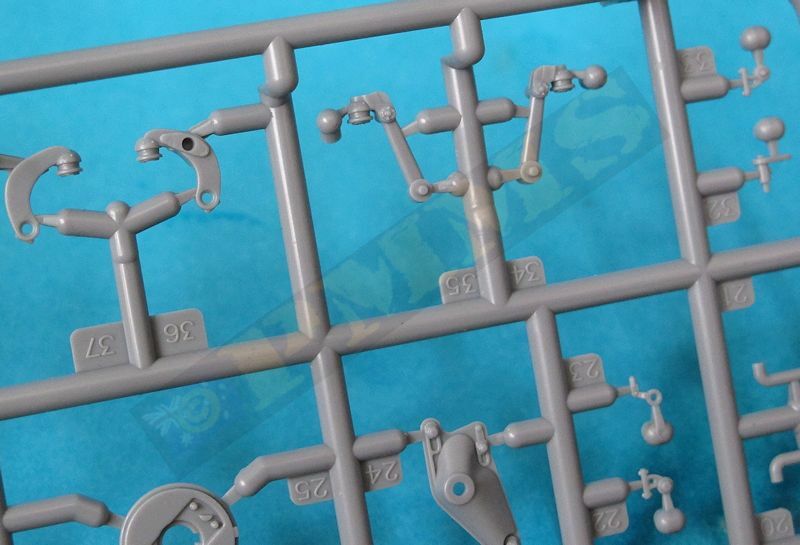 yet as detailed as the kit is there is still scope for adding additional finer details to make it even more impressive. Thanks to my credit card and and for the review kits.